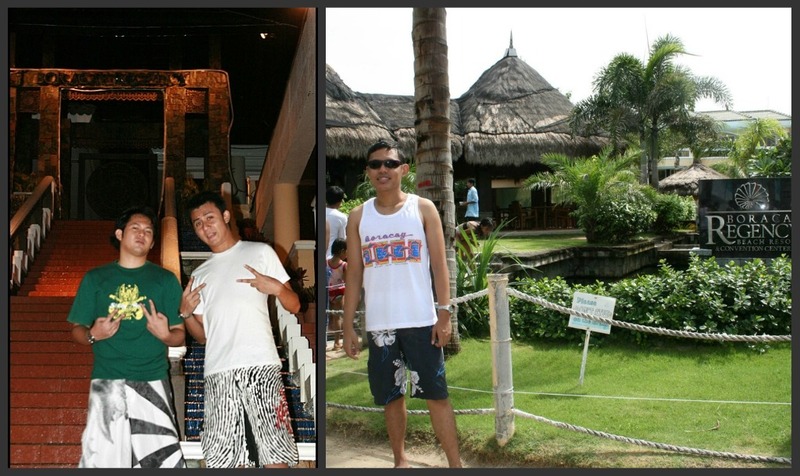 summer of 2011 was such a loser for me that i failed to fancy myself w/ a beach trip w/ all the basking in the beach and stuff (excluded was the summer company outing and Cebu’s Summer sunscream event held on the same day as my birthday – sobrang pa konswelo ito for a summer 2011 that has gone into waste). 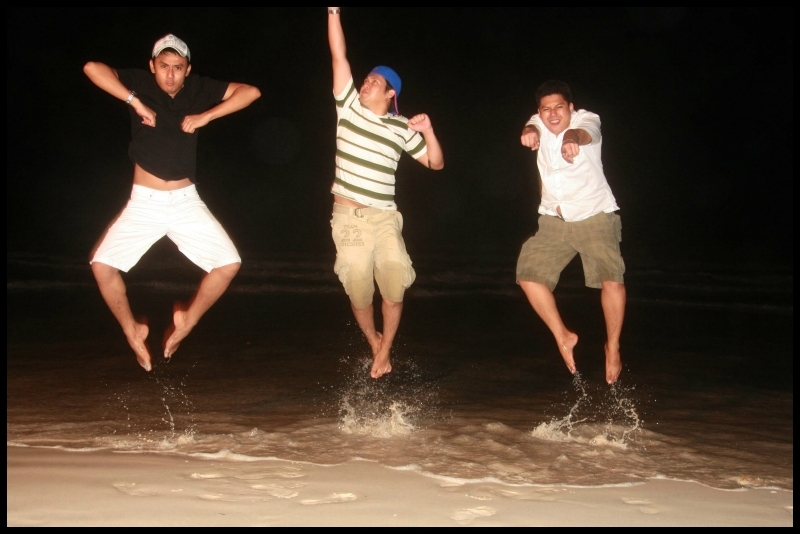 i promised myself that by 2012 i could at least spare a weekend and a 1-day VL exclusively intended for a beach binge. good thing my equally ‘tigang sa beach’ friends readiluy said yes to this plan and we eventually came up w/ Puerto Galera as our destination of choice. its near the metro. 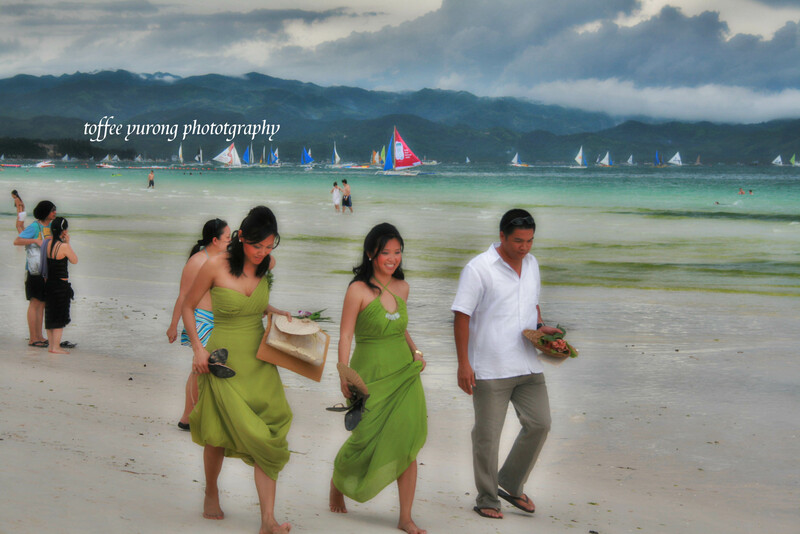 and as they say, its the ‘nearer’ and cheaper version of Boracay. 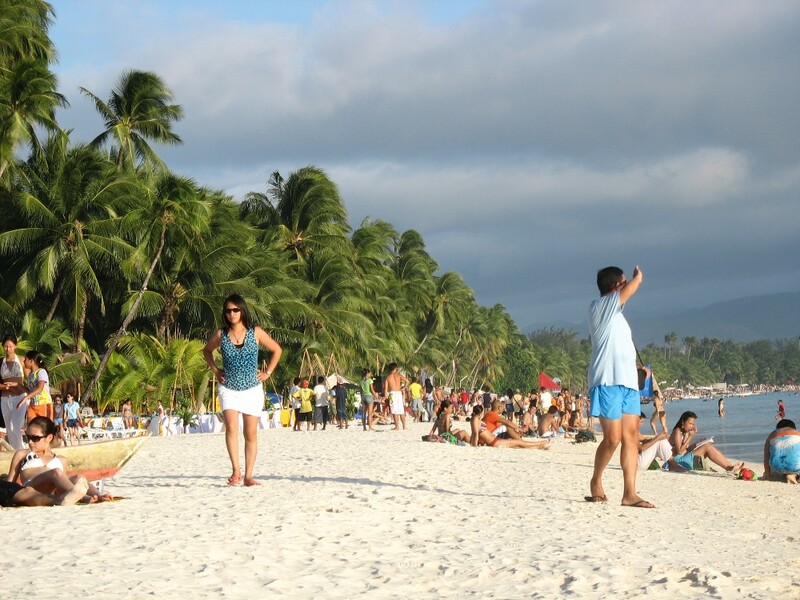 for the Cebuano in me who grew up in the most beautiful white sand beaches of the Visayas (counting in Bohol, Siquijor, Cebu and of course Boracay), i did not set my expectations that high, i would say better stick to our beaches there in the Visayas. 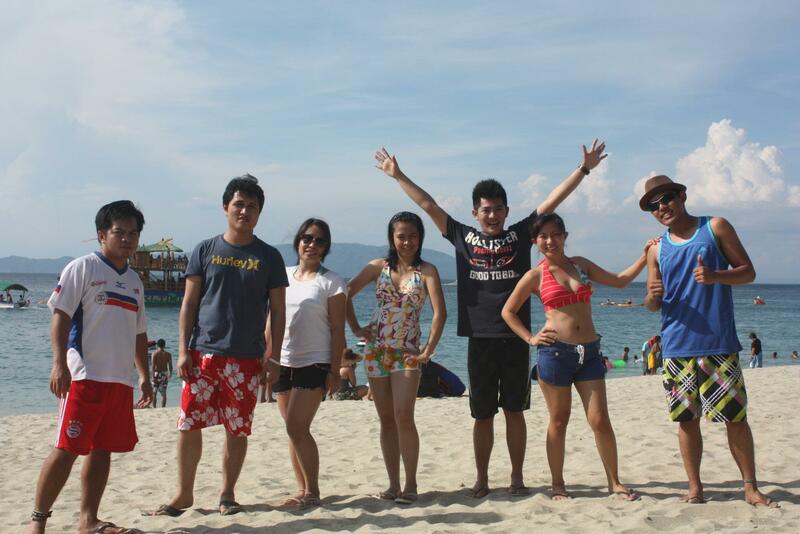 no need to spend on airfare just to be in Galera. from anywhere in Manila, just drop by Buendia Station and look for Buses that says “Batangas Pier’. this route is quite common and a bit hectic so no worries on the no. of trips and the time these buses leave (15-30 mins interval). bus fare is around 150P and travel time is 2 hours average. 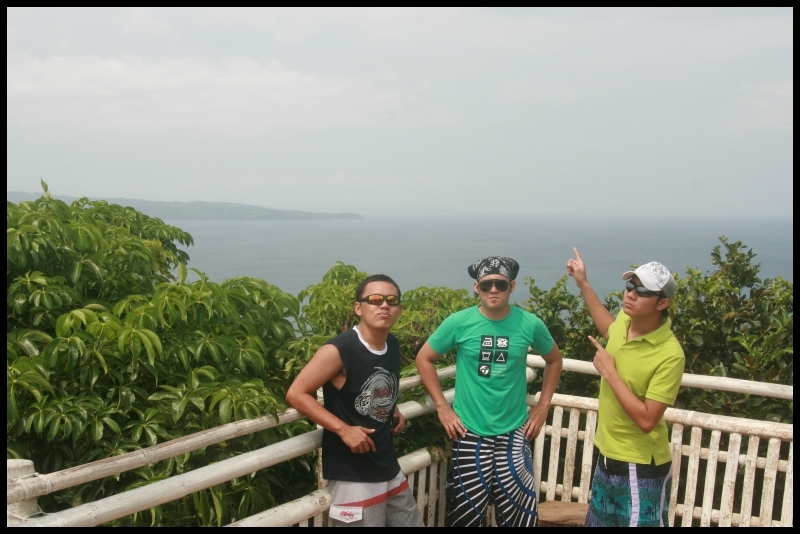 tip #1: leave manila as early as 4am so you can reach Galera at around 8-9 AM. no need to fret where Batangas pier is since the bus will take you right smack the pier (alam mo naman siguro itsura ng isang pier). there are a lot of ticketing offices their for boats plying the Galera route so again no need to worry. boat fare is around 300P. tip #2: you may ask the tticketing agent for the schedule of boats that dock directly at white beach since a few trips often side trip at other areas of Galera w/c takes time rather than the usual 1 hour boat ride. 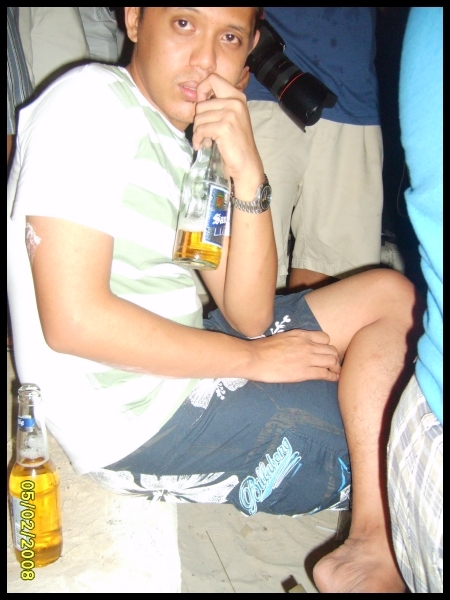 Party party in Galera!! 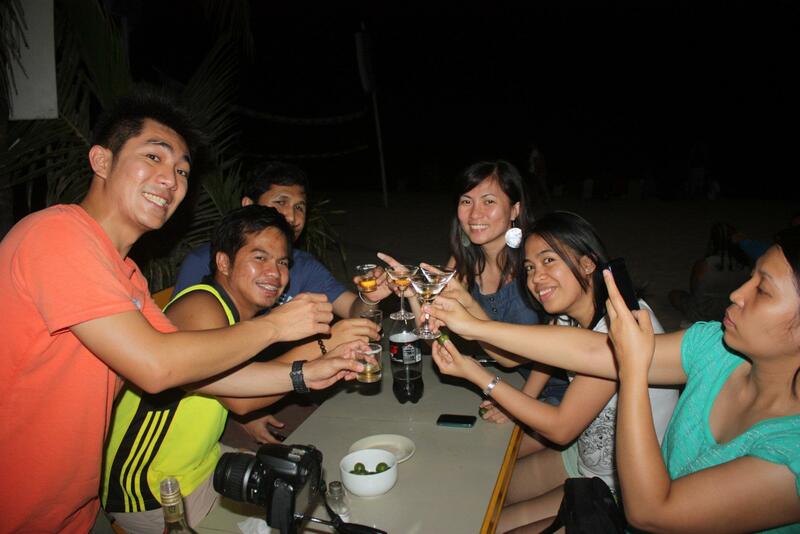 for a summer beach trip into Galera, it was sad though that my group got quite isolated from the happenings in there since we had our own time w/ Don Jose Cuervosss in the farther, more quiet side of the beach. 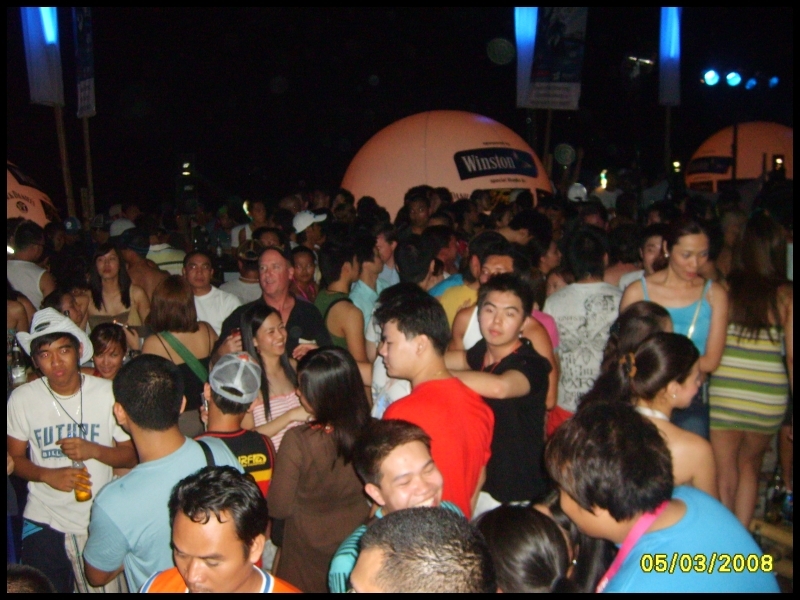 it was a bit intimate for us that we kinda excluded the Galera flavor in it…meaning no Mindoro sling samplers (w/c i totally forgot), no drag queens and stand up comedy acts along the beach fronts, no fire dances, and no B2B eye witness accounts (oops…rated SPG). reggaethon. 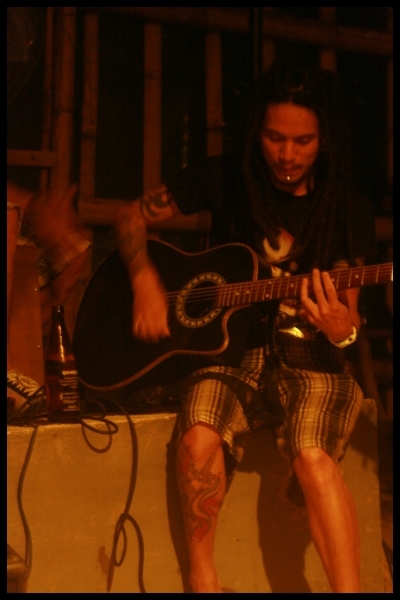 Galera is also home to reggae music enthusiasts that their nos. in this beach are quite more compared to otther beaches. be ready to be transported to Jamaica (or the Carribeans) once you opt to enjoy reggae rather than the dance music saturated bars in the white beach. 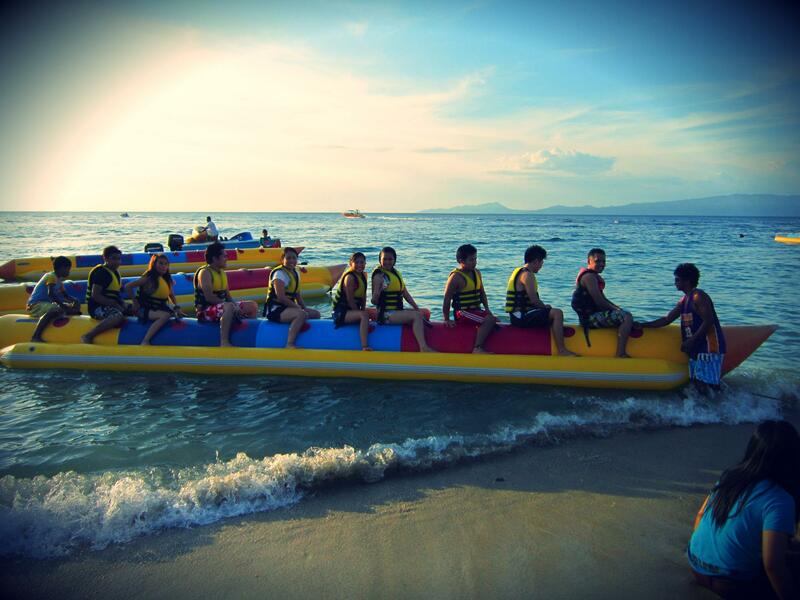 classic banana boat rides abound Galera. there arent much water sports there except for the usual jetski, snorkeling and island hopping (i cant quite recall if there was a parasailing there). 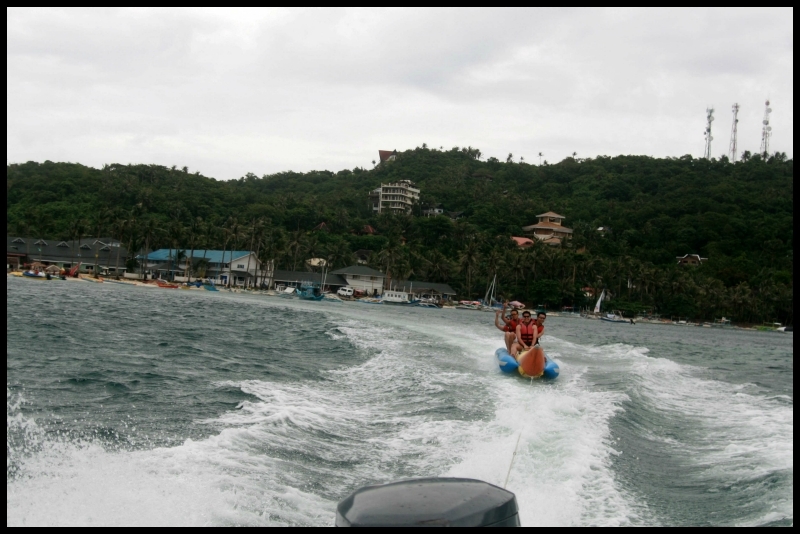 we did the banana boat ride and got really exhausted after all the falling apart but it was fun though. majestic sunset. 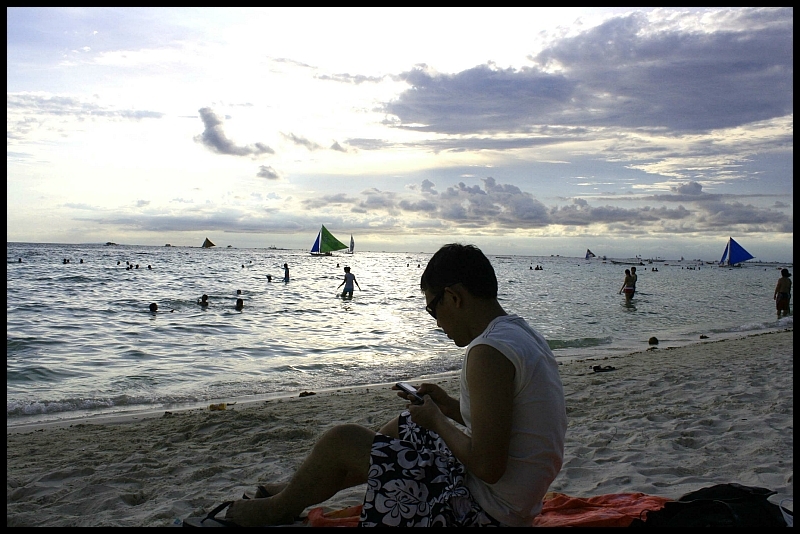 we settled down on the beach front after to await for the sunset. yes galera also has a view of the amazing sunset. 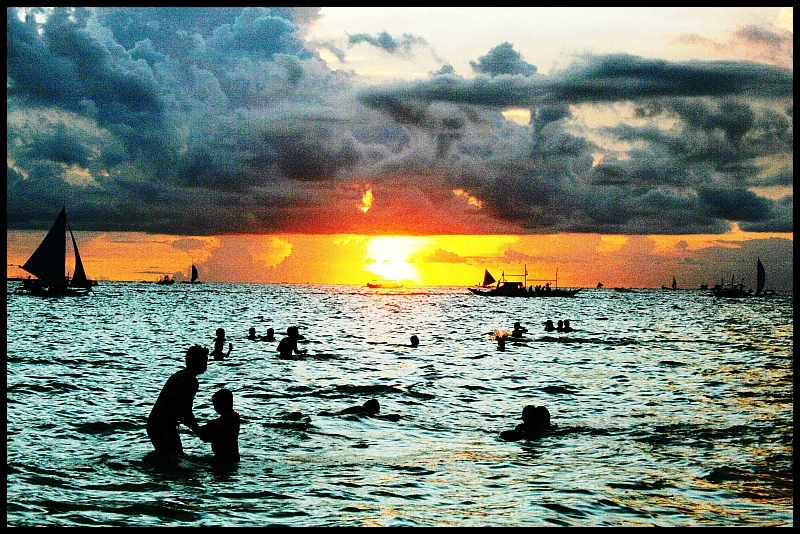 tip #5: beach fronts during sunsets tend to be TOO crowded. so if your not so much into crowds, you dont have much of a choice. swimming by the beach isnt as fun as Boracay since the water tend to get deep a few meters from the beach front (basta biglang lalim sya). so if your not a swimmer, better be careful… its also crowded in the shallow waters. quite hard to swim freely. 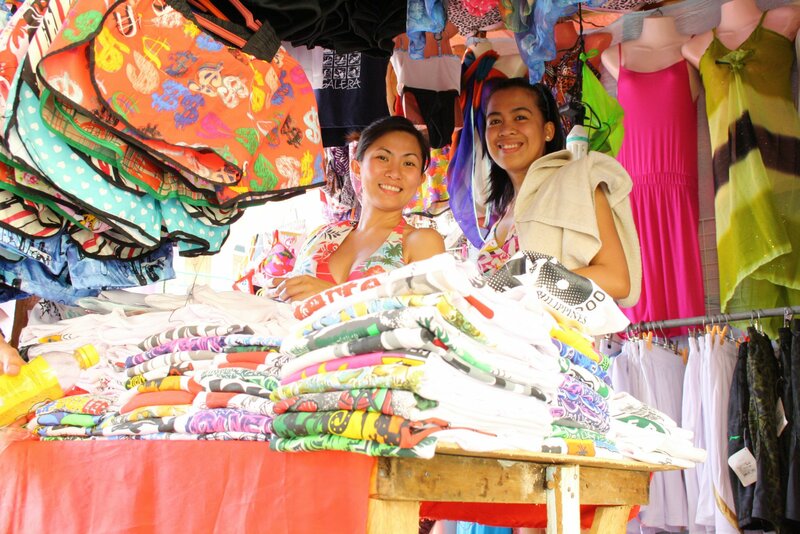 for the shopaholics, a lot of souvenir shops are found in Galera, for 100P one can buy a ‘Puerto Galera’ white sando or thsirt. the usual keychains and coin purse and a whole lot of stuff can be found in these shops. bought myself a pair of board shorts for 100P (kinda looked the original if at a distance lol). 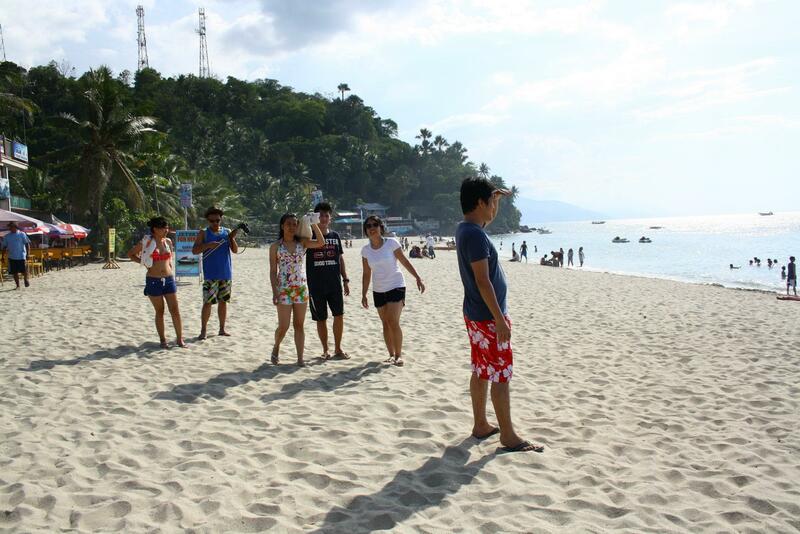 Galera during summer time is scorching hot! i myself had to rant about it (unlikely of me). 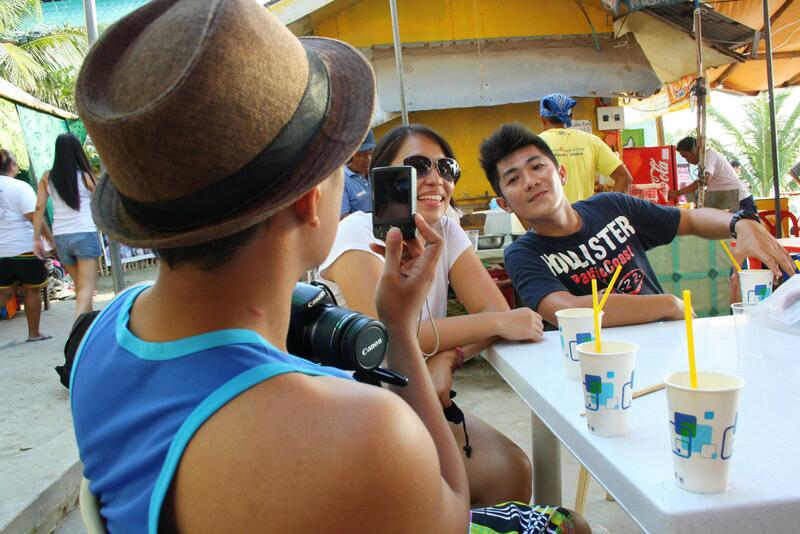 fruit shakes and milk shakes were aplenty in Galera (and very delicious too). i devoured quite a number and i specifically liked the melon shake. afternoons were spent chilling w/ milk shakes and burgers, siomais, squid,fish,crab and all other kinds of rolls… for short street foods are teeming around Galera’s beach front (one edge of galera vs. Boracay). i was specifically very happy when i saw a barbequed banana (totally different from a sweet bananaque, basta yung bnibenta sa labas ng skul na may margarine)…. i had too much of it i had to hit the comfort room 2x. lol. henna. 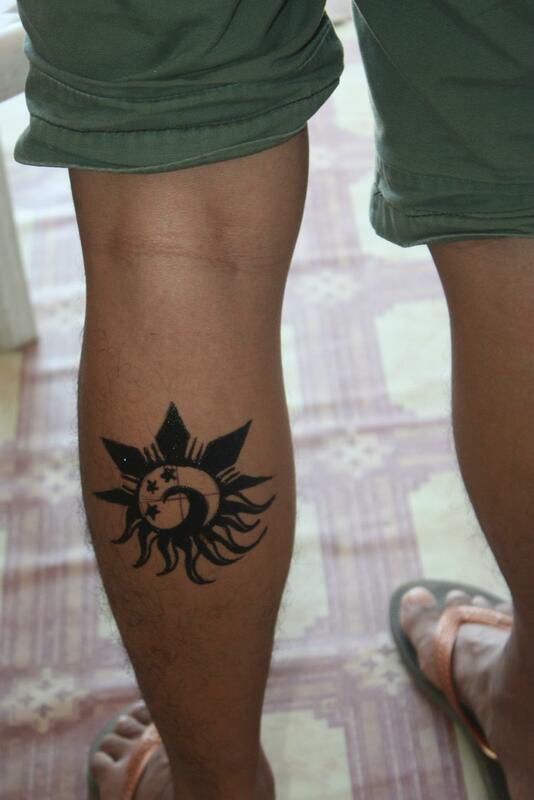 i wanted some so i decided to have my henna tattoo (w/ mami let, salamat sa impluwensya lol for 200P. bad thing it smudged 2 hours after due to a very bad experience on our way home. 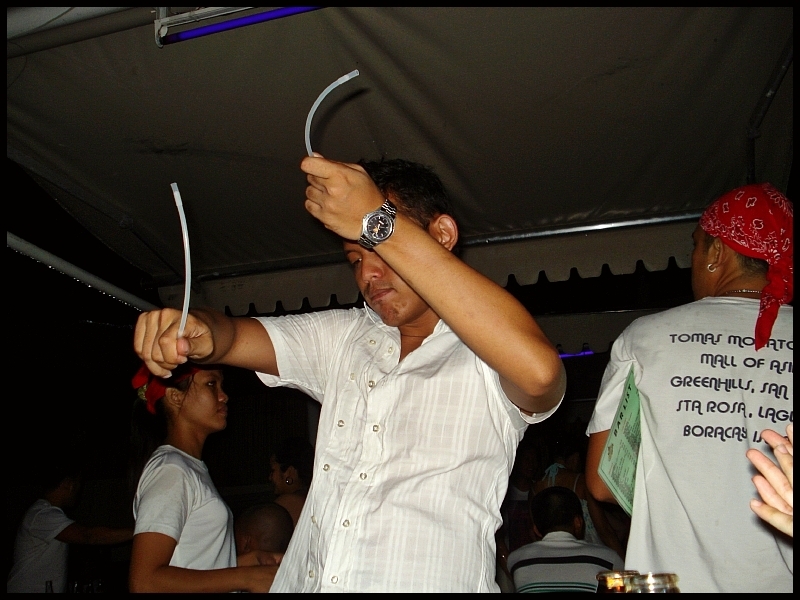 a lot of mid priced food strips are lined in the beach front of Puerto Galera. 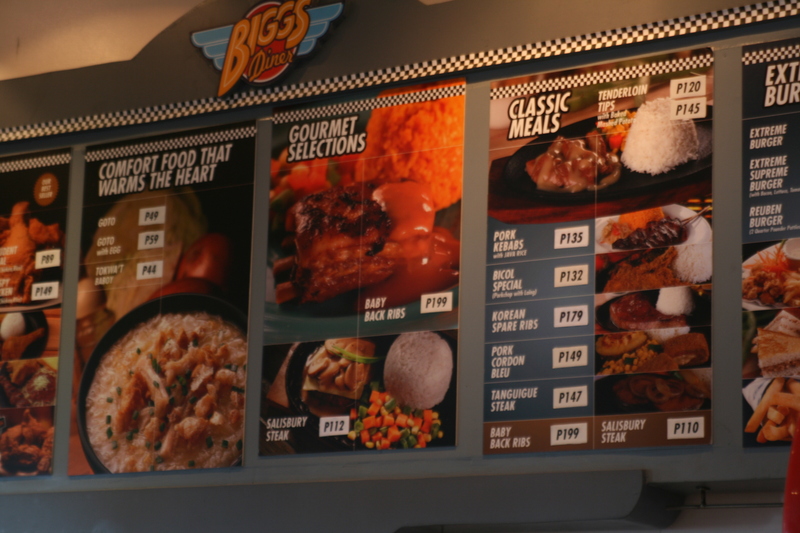 i was hoping i’d find a lot of sea foods in the menu but unfortunately most of their offerings consist of chicken, pork bellies and tilapias. 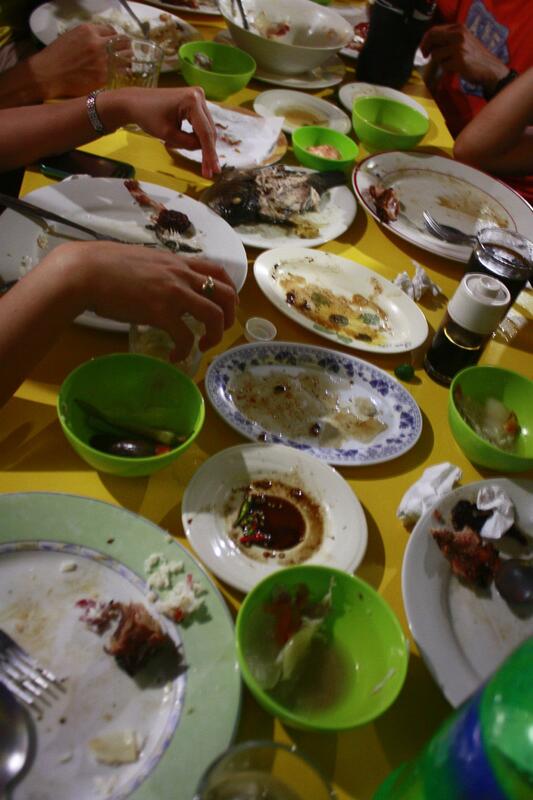 it was a bit of a struggle for us to finally find a resto w/ calamares and some salt fish tinola. 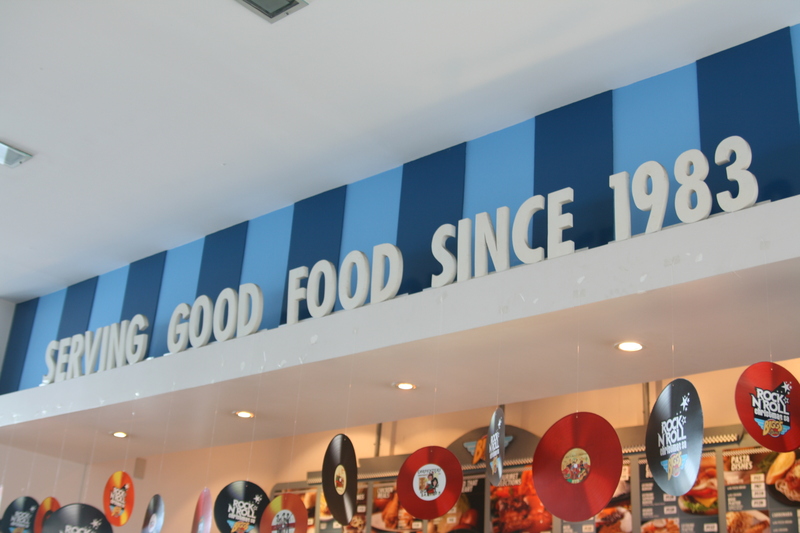 but heck, when one is hungry, one eats everything…yum2x! 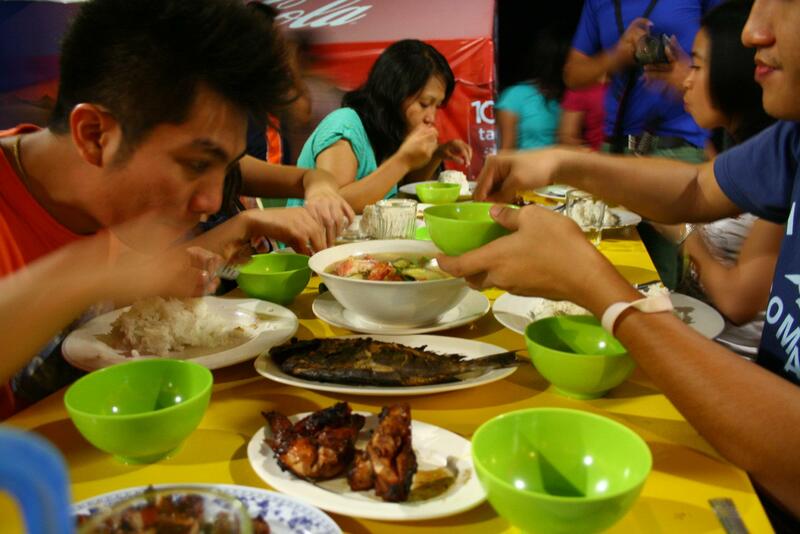 tip#6: try to haggle for the price as some restos tend to offer cheaper compared to the others. 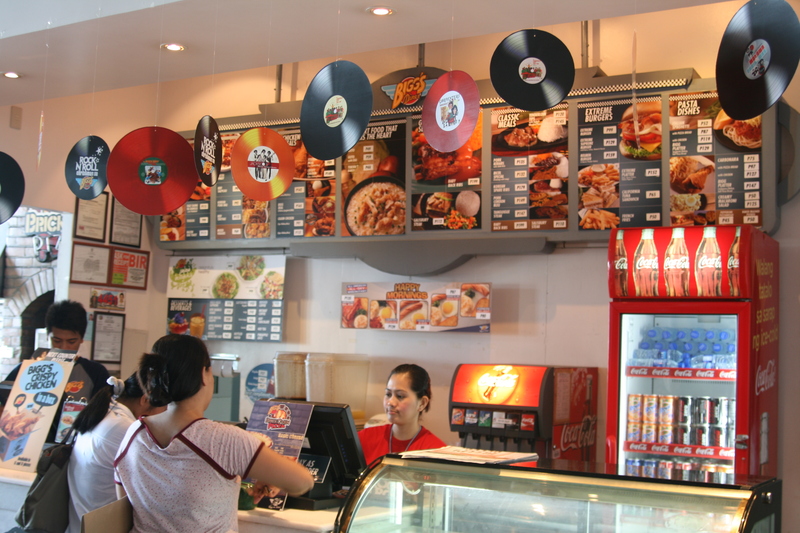 try also the set menus as they tend to be more cheaper compared to ala carte. 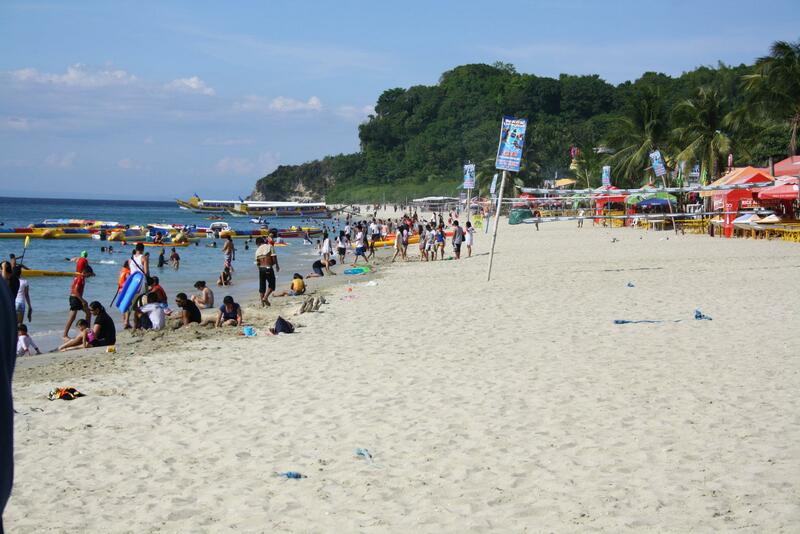 tip #7: must read – leave Puerto Galera w/ the 3PM boat trip so you can still catch the 6PM buses bound for Manila… 7PM onwards will be quite a struggle already as buses going back to Manila become fewer. 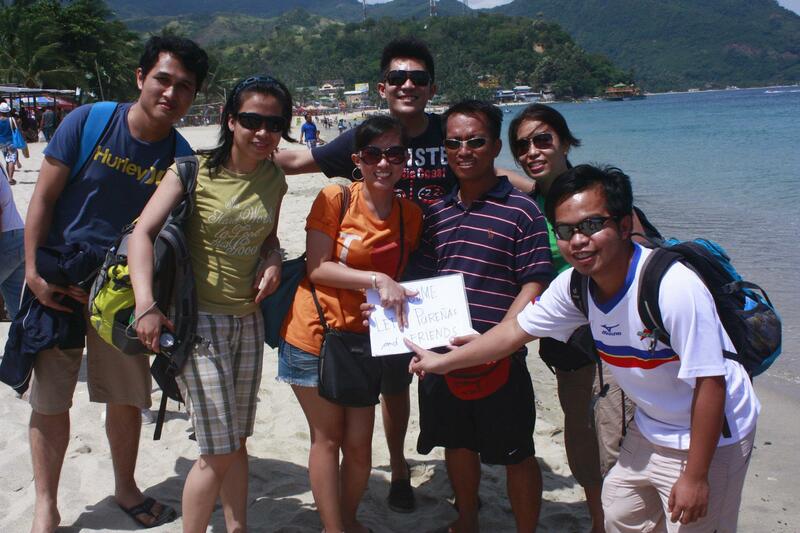 tip#8: there are a lot there who offer package tours for otther activities in Galera such as hiking, biking etc. 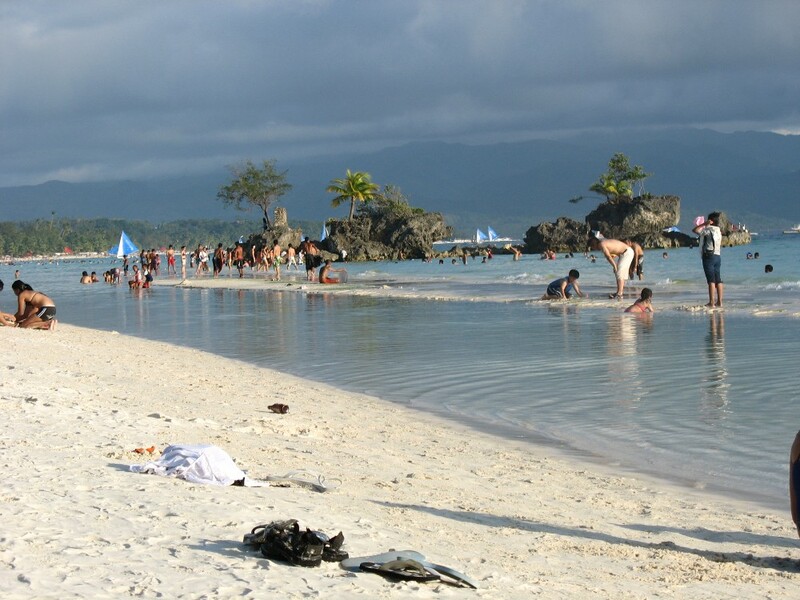 so if you want more than beach escapades, no problem in finding alternative things to do there. As i gear up for my upcoming travels (including a regular uwi sa Cebu later this afternoon, the Singapura getaway w/ family on December and the Bicolandia trip next month), i came across these videos specially made to entice foreign and local tourists alike to discover the PHILIPPINES’ hidden wonders that are well worth a visit. nakaka-indak, napapasayaw ka, and these songs make you CHOOSE the PHILIPPINES and definitely TAKE U TO THE PHILIPPINES, kaya TARA NA BYAHE TAYO! Take U to the Philippines – Apl.De.Ap. …and the classic…who doesnt know this song or havent heard this in fast crafts and buses during travelling. Let’s face it, the moment i first set foot in this beautiful (and still an understatement) tiny island, i knew that i have fallen truly,madly and deeply in love with it. 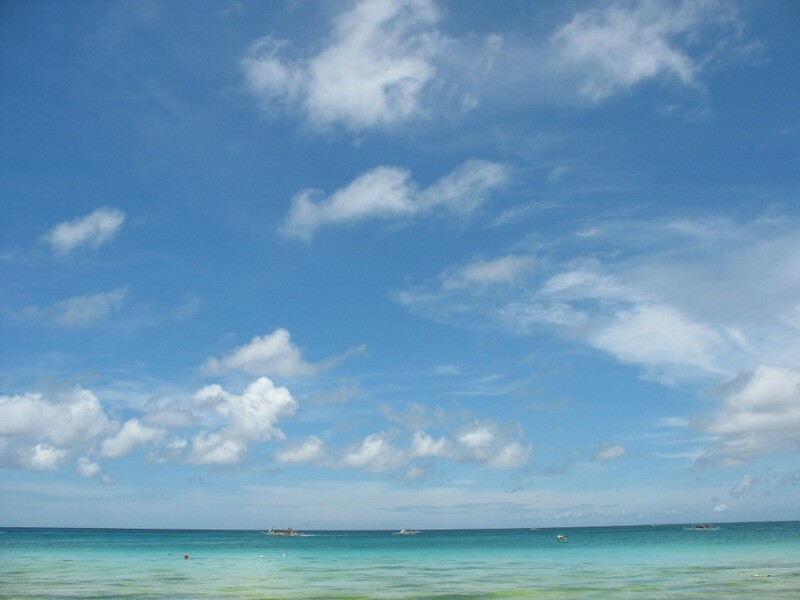 i want to make love with Boracay! i dont know why, the beaches in Bantayan Island, Siquijor and Bohol could actually equal to Boracay’s but there is this something, something that is beyond words why i cant stop falling for this gem. 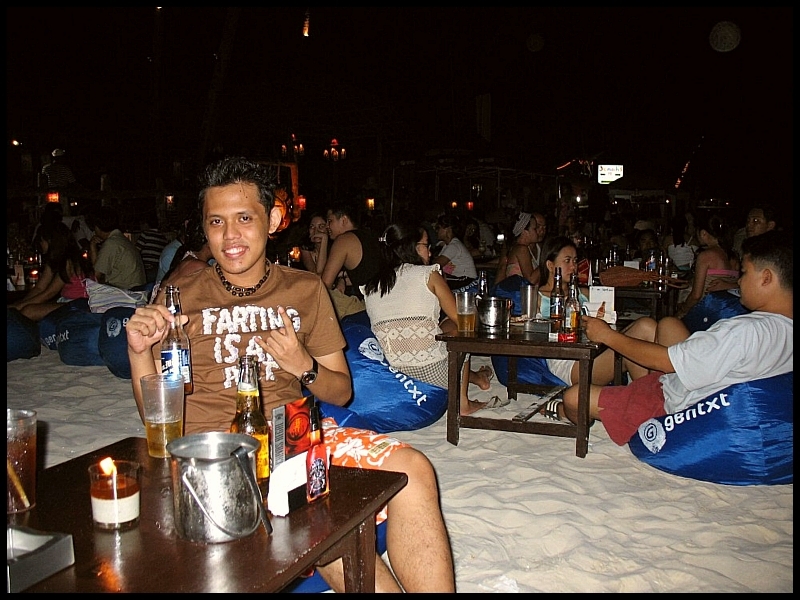 its been 2 years since my last visit in Boracay and i have been itching to go back this summer of 1012. fingers crossed, sana matuloy. to those buddies and friends whom i have been relentlessly making ‘kulit’ to start planning for the trip, man lets do this, PLEASE!! 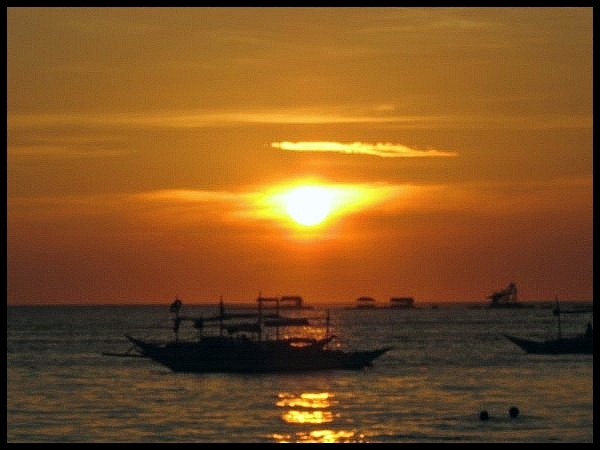 Have that inexplicable feeling of peace and quiet while watching Boracay’s famous sunset. 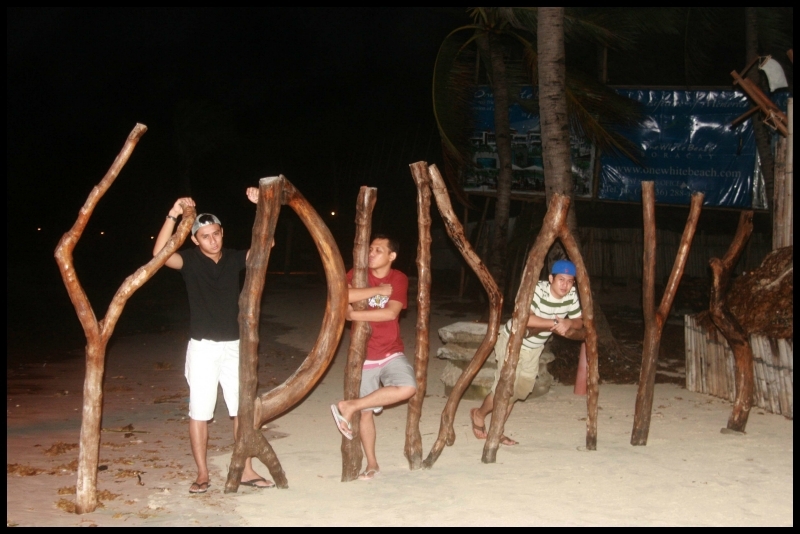 have a photo op at the famous sand castles and sand designs (ung may mga kandila sa ilalim). then w/out any hesitation donate 20 PESOS (despite the the presence of a few dollars and hundred pesos in the donation box. 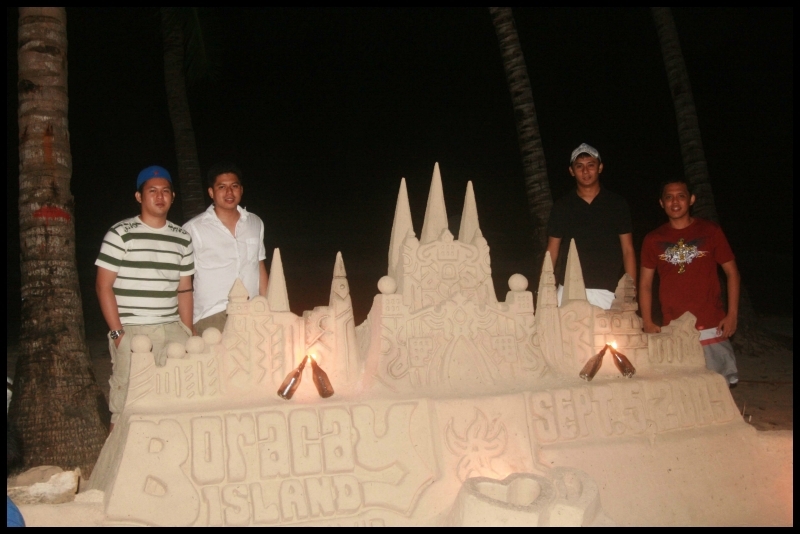 insert in the to do list in boracay : DESTROY sand castles lol. just pay for it first. 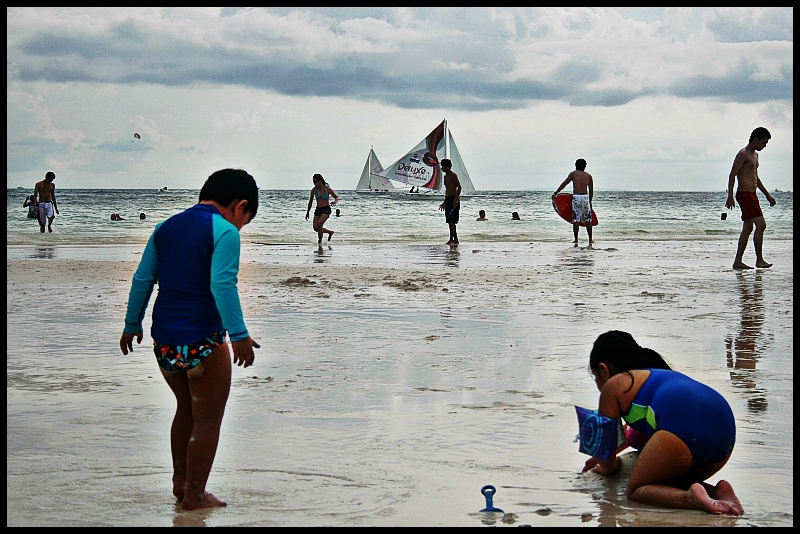 put the kids to sleep early to ensure the boracay nightlife is not jeopardized. 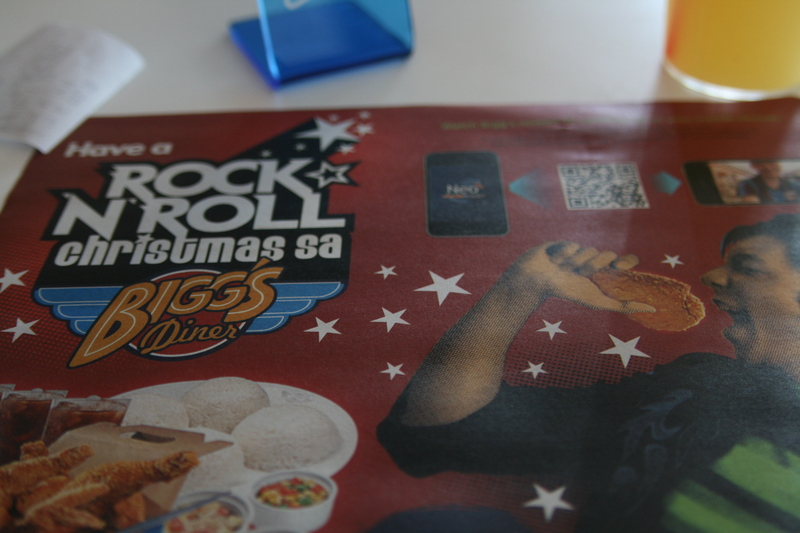 pardon me on the photo, i dont have any other photos of Jonah's shake yet...urg. konti na lang may tan lines na! 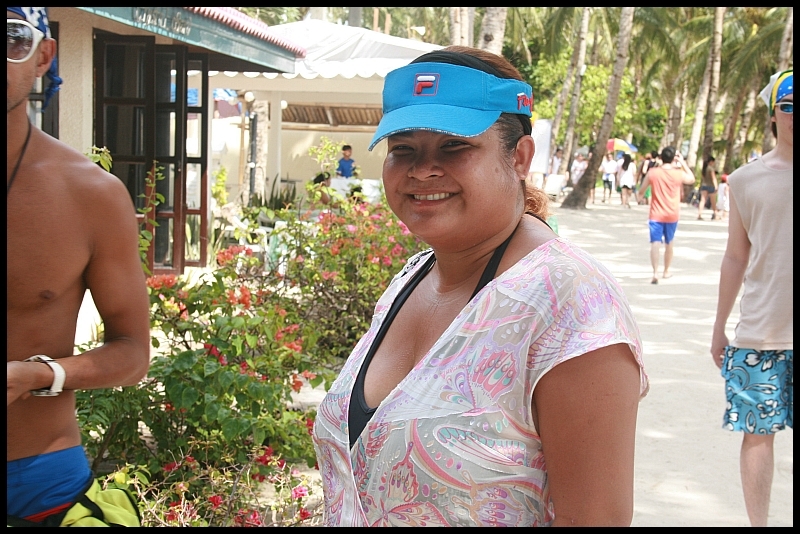 meet kat de castro, dont ask who among the showbiz pipz i took paparrazi photos with...ang jologs kasi. 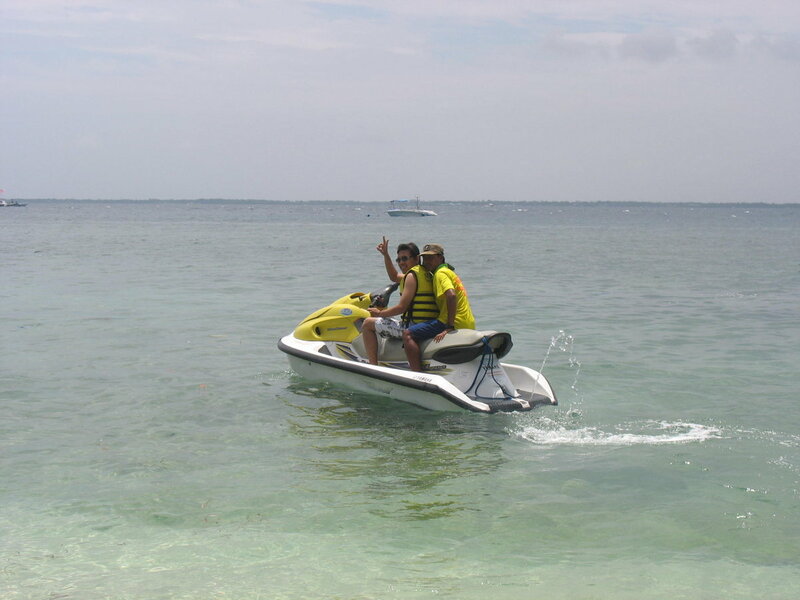 Watersports overload…and at dirt cheap price during off peak. 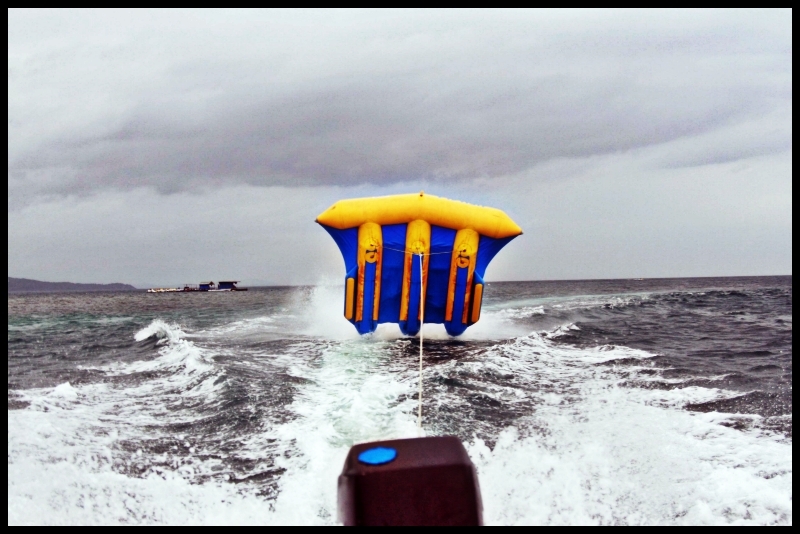 the banana boat ...the boring banana boat, naks! 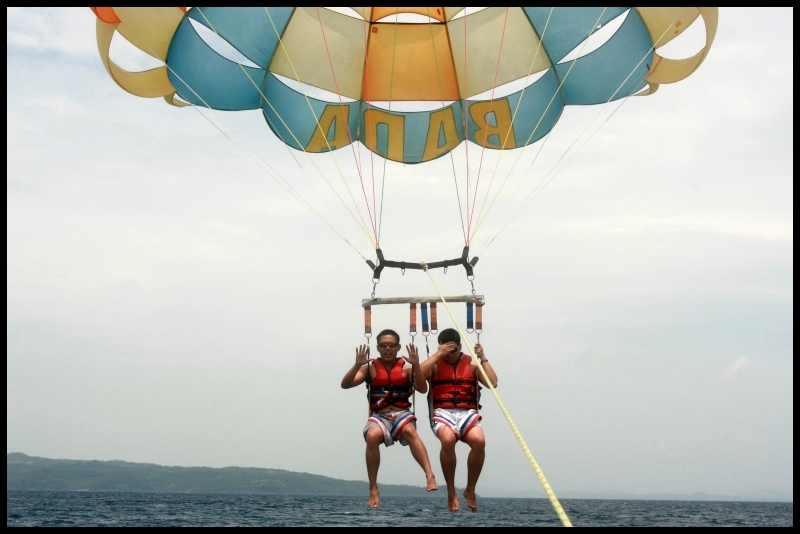 the best among all, parasail! idol! 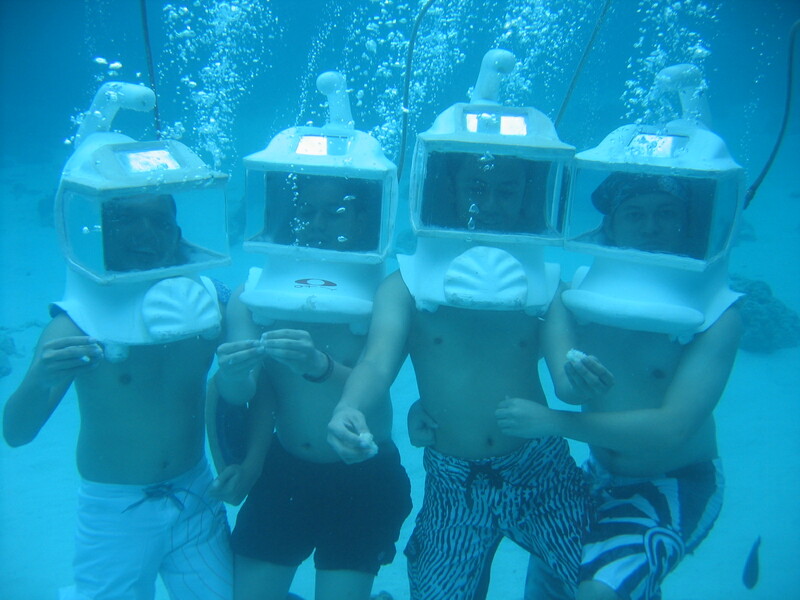 Underwater helmet...little mermaid mode nyahaha! 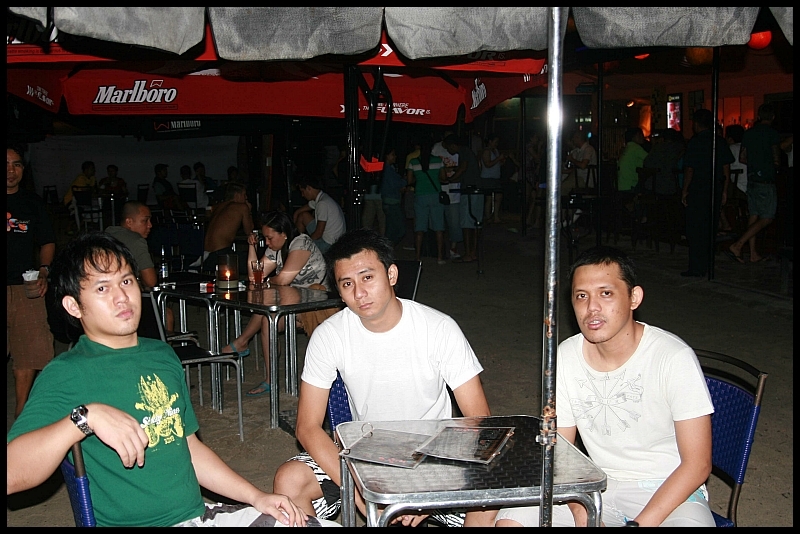 before lambasting one's self in the clubs of Boracay, its a must to check the reggae bars first. 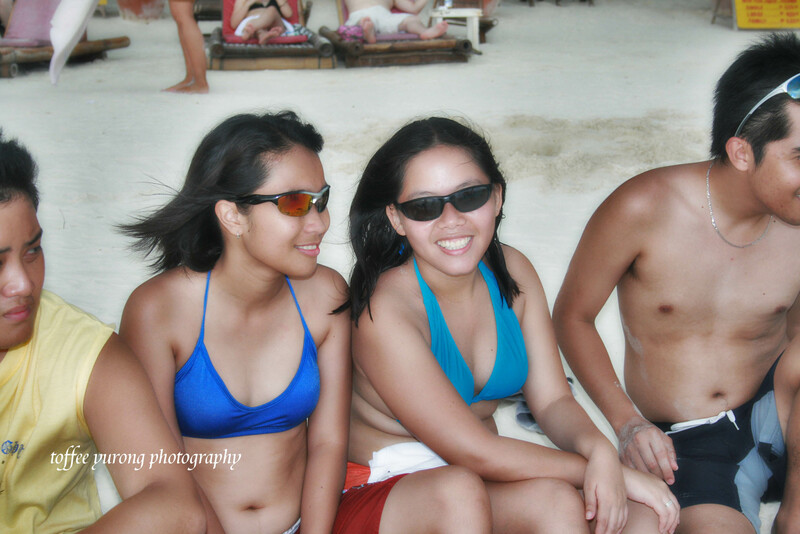 beyond anything else, what made the whole Boracay experience well worth it was the people whom i was it. 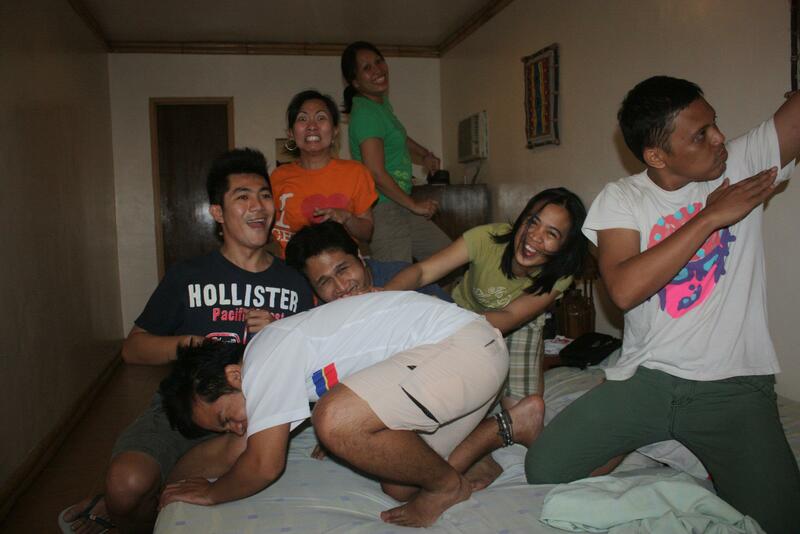 its more memorable and more happier when your w/ people you treasure. anybody who’d receive this kind of message just hours before the trip would go berserk. i had to rely on my quite convincing powers and assure her that there was no storm at all and that the ‘lubak2x na daan’ in Aurora is already history. around 80-90% of the roads leading to Aurora are now concrete. i just had to call her and tell her to pack up fast and we’ll just see each other at the GENESIS Bus Terminal in Cubao, Quezon City. whew! 1 hurdle down. Off to Baler we go! all the while i thought this trip is going to be a smooth sailing one. i knew that buses plying the Aurora route doesnt have a 24-hour schedule. they leave Manila the earliest at 12mn, 1am, 2am and the next will be at 430am, 530am and 7am.. since we were on a tight schedule w/ just over the weekend to travel, i planned to take the 12mn bus, early enough for us to have more time to explore Baler in the morning. Much to our dismay, when we arrived at the bus station at around 10pm, the 12MN and the 1AM buses were already full. that left us w/ the 2AM bus as our only choice. the catch: there are 2 kinds of buses that ply the route, all under Genesis Bus. its their regular bus (aircon deluxe) w/c is priced at P418. w/ a couple of stop overs, the total travel time is 6 hours. 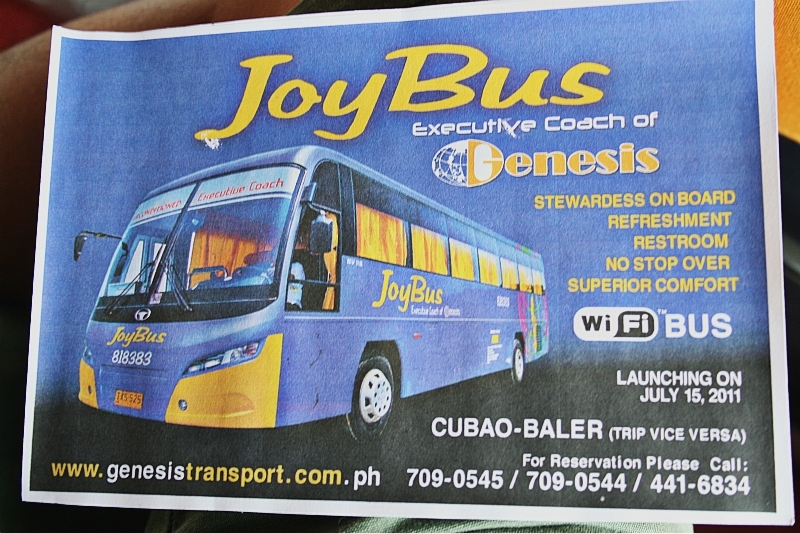 the second one, is the Joy Bus, their executive bus w/c is priced at 650P with no stop overs. travel time is 4 and a half hours. obviously besides the price and the total travel time, one of the major (for me) difference is its comfort. deluxe bus is just like the usual aircon buses that i ride for an hour or less. i was quite unsure if i can handle that kind of ride for 6 hours. too bad the 2am bus is the delux bus. well, for the budget conscious in us, we were left with no choice. we left Manila at around 145am since the bus was already full, we were still traversing EDSA when i got into deep slumber already. 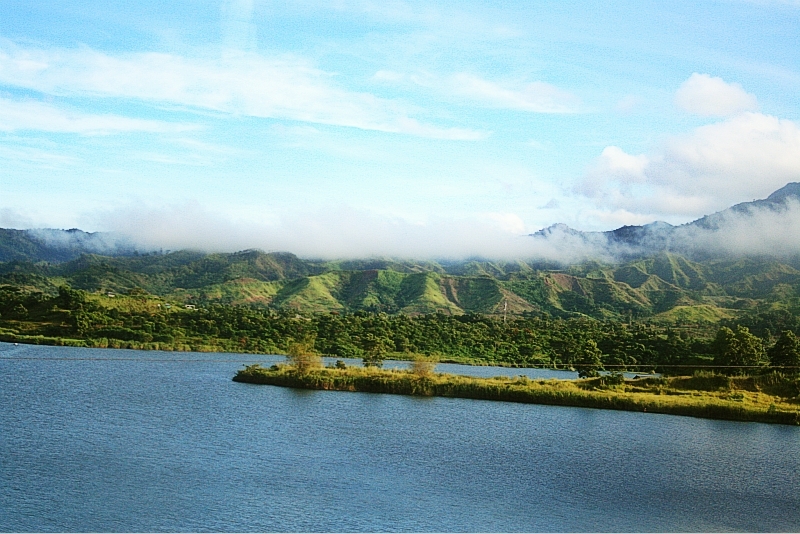 i wasnt really sure how many stop overs we had but the last stop over was in Pantabangan Nueva Ecija (remember the great Pantabangan Dam in our HEKASI class? 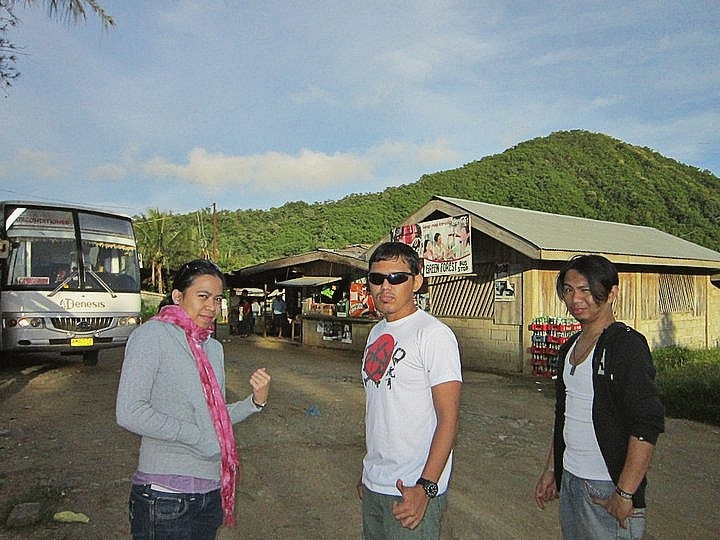 ), the last town before we set foot a part of Nueva Vizcaya and finally the province of Aurora. and yeah before i forget, the zigzag part, roughly an hour, was actually the time when we crossed the Sierra Madre mountain range. 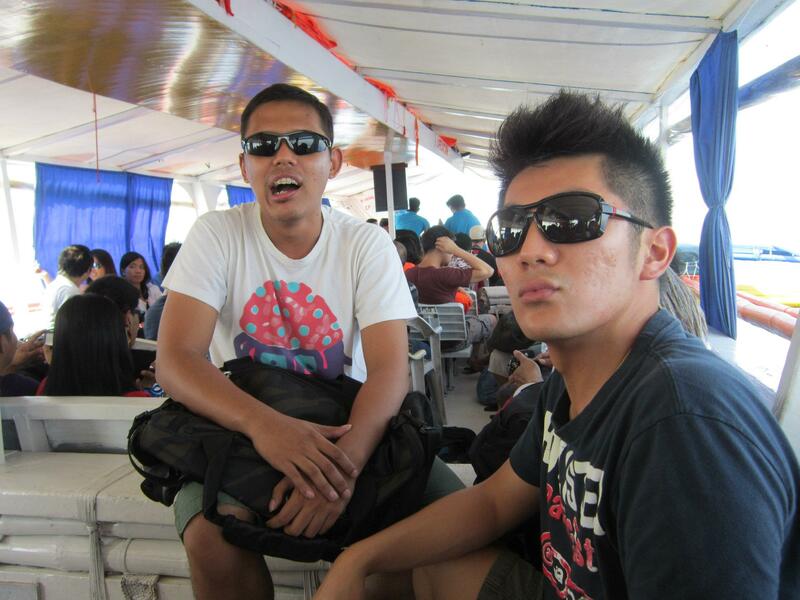 Carlo and Rovi got sea sick and had a difficult time sleeping while were driving along the zigzag road. me on the other hand didnt have the slightest recall about it because i was totally asleep, the movement inside the bus didnt wake me at all. 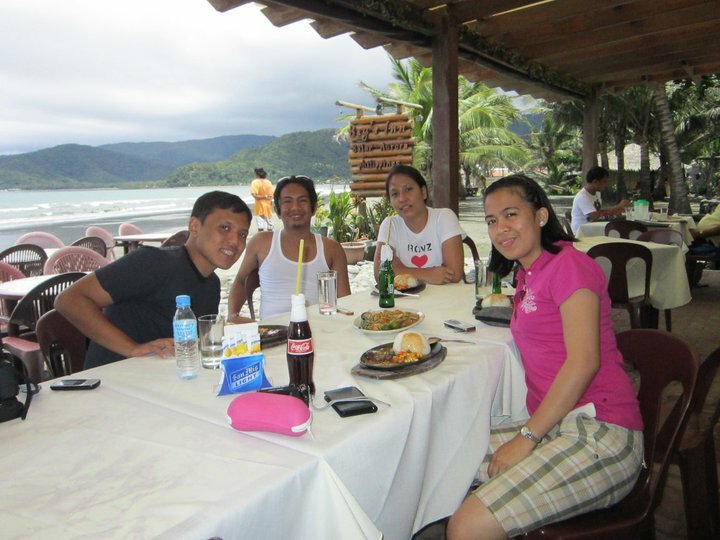 we finally arrived in Baler at around 830 AM, my back hurt like hell even if i was asleep most of the time. if the ‘to’ trip was a bit of a struggle and adventure, the ‘from’ was the exact opposite. 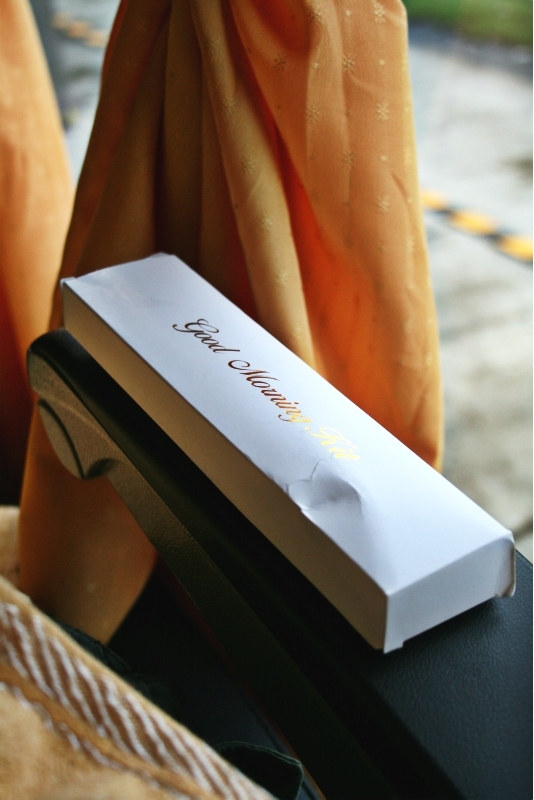 it was seamless, no hassle, no backpains and it felt like we were on a business class flight! mind you we had a lady stewardess instead of a male ‘kundoktor’ (add also the lavatory)! we decided that for the return trip, we must gather enough rest and sleep since we came from a strenuous surfing activity. 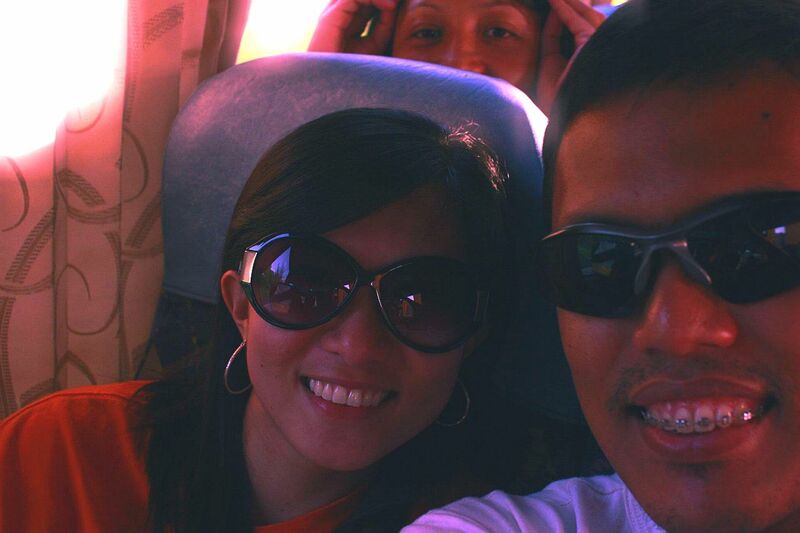 we decided to take the Joy Bus which only has one trip a day that leaves Baler at 3PM and travels none stop to Manila. i was only able to sleep when we were already in Cabanatuan so i was able to experience the zigzag road they were raving about. and indeed it was quite a crazy nausea-inducing ride with bags dancing left to right and back. we arrived in Manila at around 7PM and finally touched base in Cubao terminal by around 730PM. 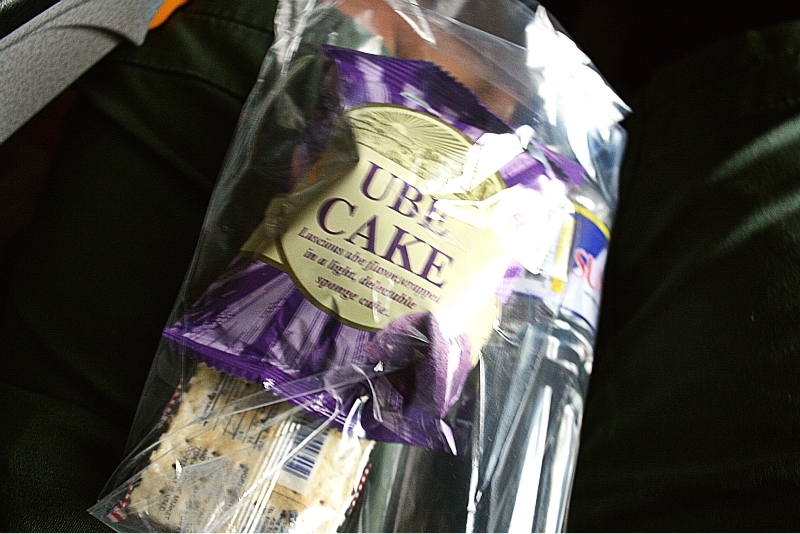 complimentary snacks composed of a cup cake, biscuit and mineral water...not bad! Be Early. usually weekends gather many passengers travelling to Baler and Casiguran so chances are you might have little possibility of getting into the 12mn trip. i asked one traveller who got in the said trip and she told me she was already there as early as 8pm. 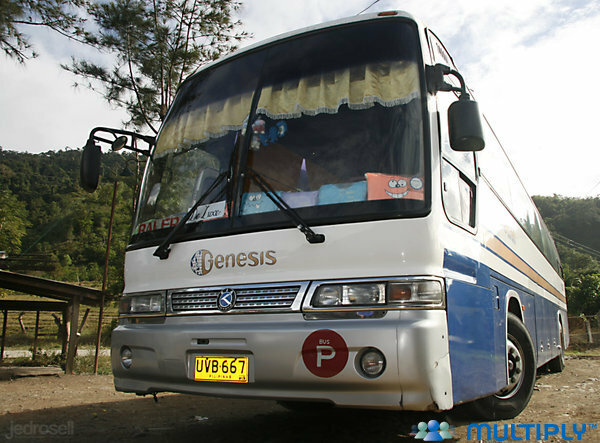 there are so many buses plying the Manila – Cabanatuan route so there is no problem in choosing what bus to take. e.g. ES Transport, Genesis, Baliaug Transit, 5 star and other local buses. Cabanatuan to Baler also has a lot of local buses with dynamic schedules. Vans / Vhires are also available. Now here’s the tricky part, when i asked around Cabanatuan if there are frequent trips coming from Baler, i got quite a number of different answers. one said the latest direct trip from Baler to Cabanatuan was at 3pm and another one told me that its 7pm. just to be safe. i strongly suggest you take the 3PM sole direct trip from baler to Manila to avoid any hassle especially if your going to work the next day. what we did was when we arrived, we immediately went to the ‘Genesis garahe’ and looked for the dispatcher and convinced him to reserve us our seats for our return trip. we even offerd him to pay in advance so that we can choose our seats. luckily he agreed. 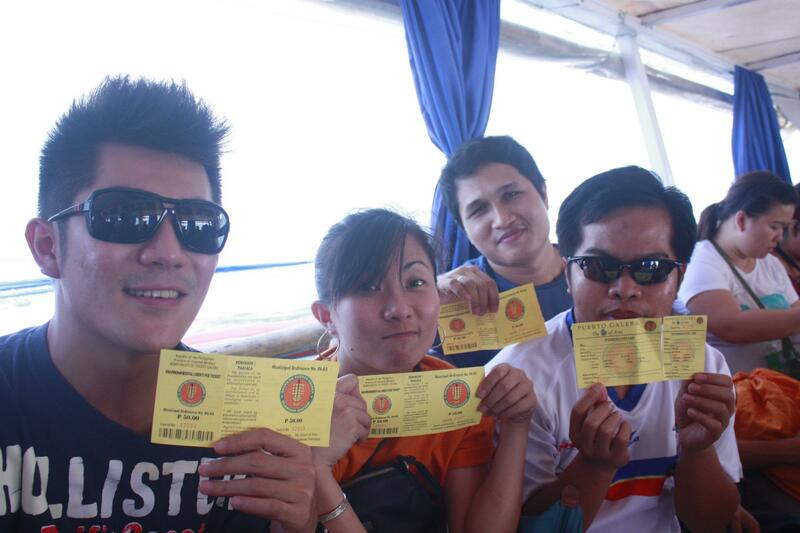 actually when we got into the garahe there were already 3 passengers who reserved their own seats for the 3pm trip. Its not how many times you fall that matters, its how many times you rise up from that fall that counts. – a ‘gasgas’ cliche we always hear yet its completely applicable to the world of surfing. 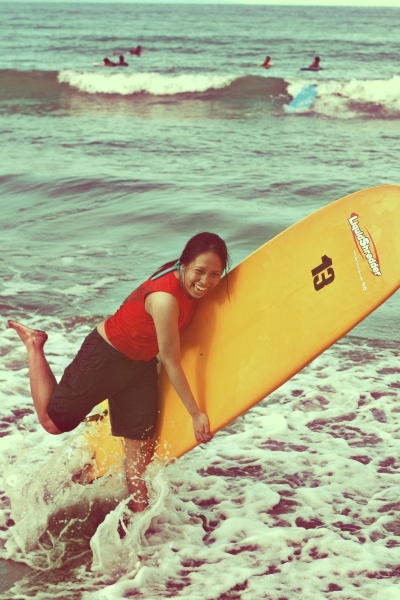 last weekend i was again at the peak of my ‘beach bum’ element as I and 3 of my college and travel buddies Rovi, Laiza and Carlo went on to fulfill another adventure in our bucket list – surfing in Baler. 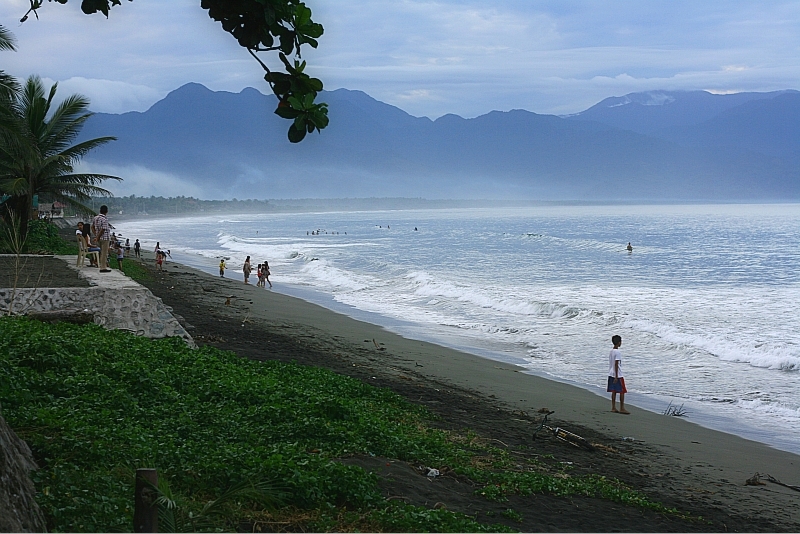 Baler is an emerging destination for local and foreign tourists. by word of mouth it has slowly paved its way in the list of must see places in the country, surfing is a huge contributor to that. add also the historical value of this town for being the birthplace of the country’s only commonwealth president, Pres. Manuel Quezon and home to the political clan of the Angara’s (they deserve the credit for promoting Baler and the province as a whole). 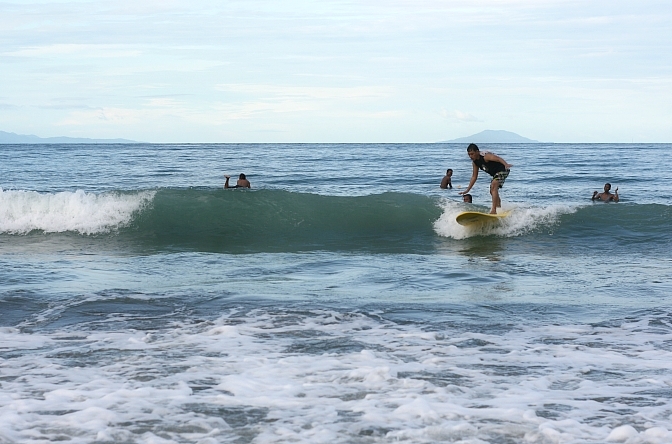 it probably also has the biggest number of surfing community in the country numbering to about 30 to 50 surfers. 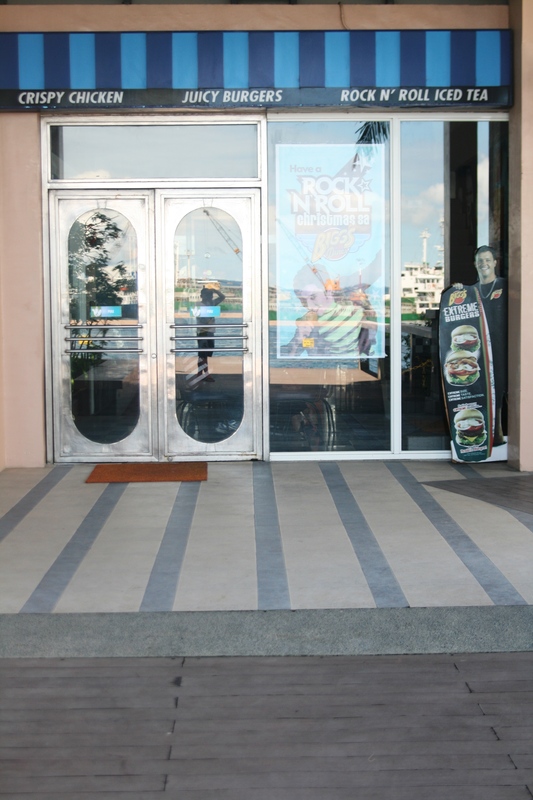 they are also the ones who tutor surfing enthusiasts who frequent the place. because of the intense excitement to finally hop on that surf board and ‘do’ the huge waves of Sabang Cove, i might have to apologize that i had to forgo the other attractions that this quaint little town (and the province of Aurora in general) offer specifically the waterfalls and the largest balete tree (they say in Asia) in the adjacent town of Maria Aurora. please do refer to Sinjin’s libotero.com for his more in depth feature on Baler. we only had the weekend for this trip so the slight mix up with the itinerary caused us a huge chunk of our time thus the failure to visit the said attractions. 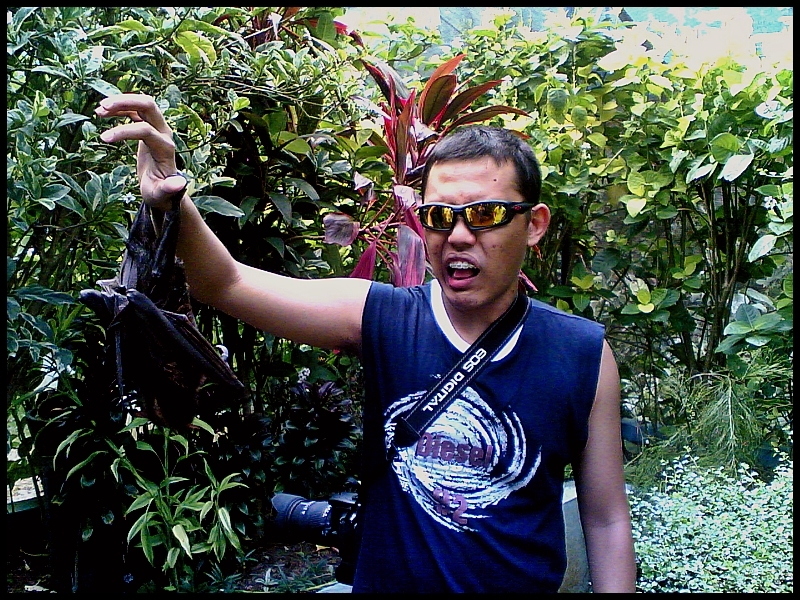 for redemption purposes though, i have alloted the second part of this series for the other places in Baler we visited. 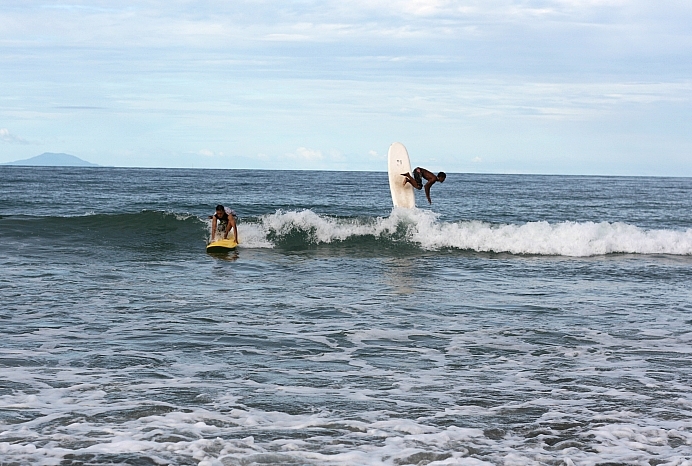 many think, including me, that surfing is one heck of an extreme sport. the ‘dare devil’ factor is high and that it sometimes equate itself to either injury or even drowning. 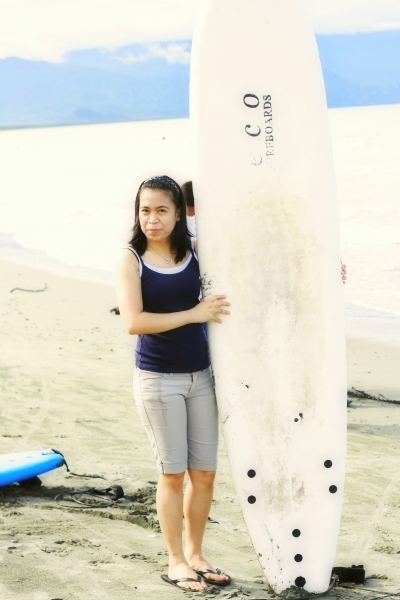 it gave me such thought- maybe, just maybe, if there’s one extreme sport i can handle, i guess its surfing. 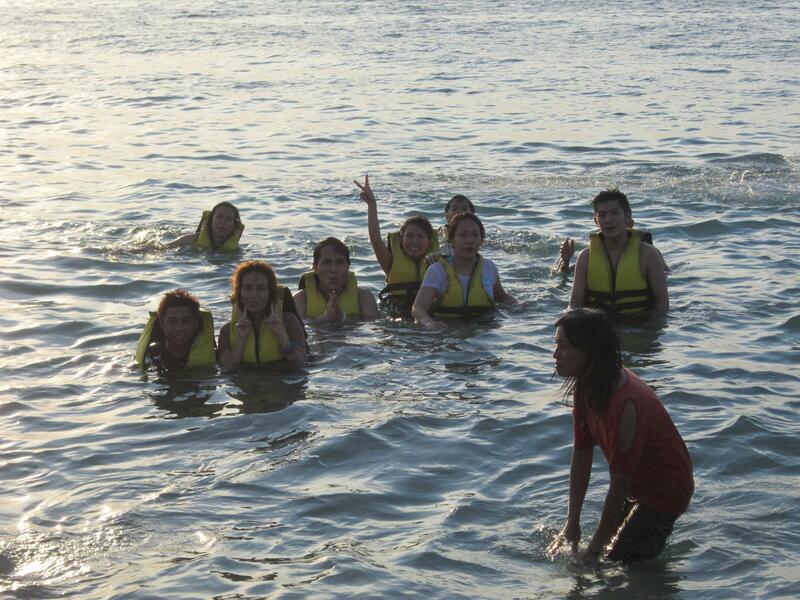 for one, i know how to swim and for two i dont mind drinking liters of sea water. 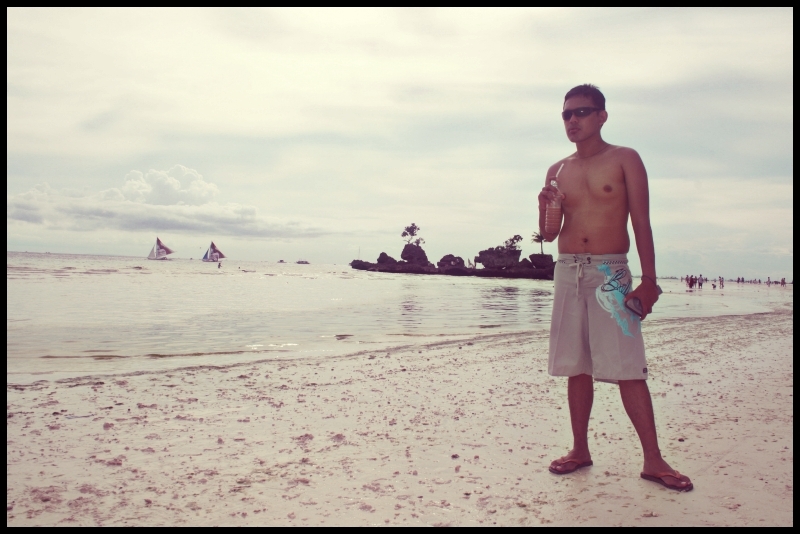 my being a beach bum is nothing if i dread the taste of salty sea water. the mid afternoon sun coupled with the sound of the crashing medium sized waves in Sabang Beach was a classic hit for us that we wasted no time and hit the beach in our (at least for me) most stylish board shorts. finally my board shorts was used fit to its REAL purpose. lol. 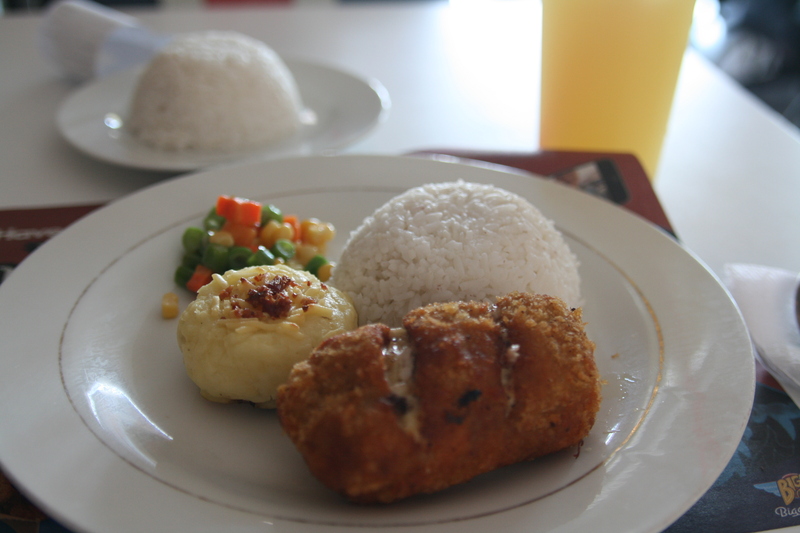 ‘maling akala’– perfect!, what i thought was easy and doable was actually the exact opposite of it. it took me 30 mins to even stand at the board. and i withstood it for roughly … 3 steps, and well, i fell off right after. as they say practice makes perfect. it took me about an hour more to finally look ‘stable’ on top of a board. 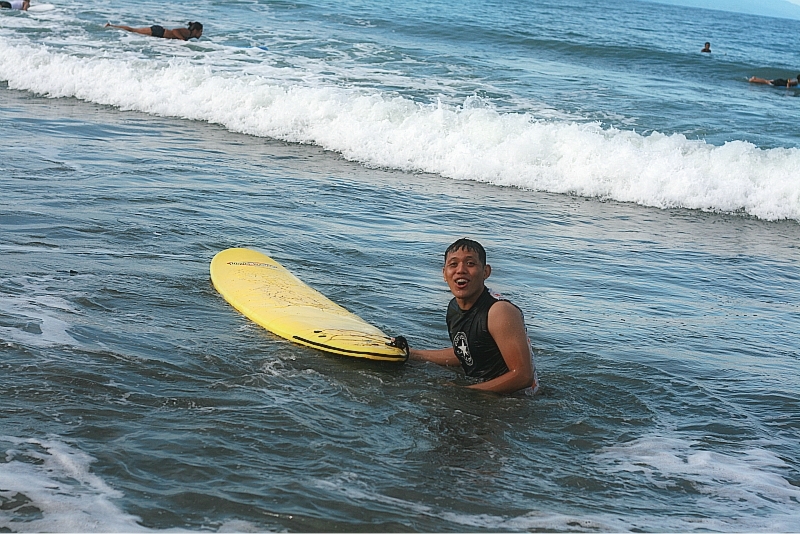 i pretty much got addicted to it that the whole surfing experience took me 3 hours before i said ‘ok, its a wrap….malufet!! 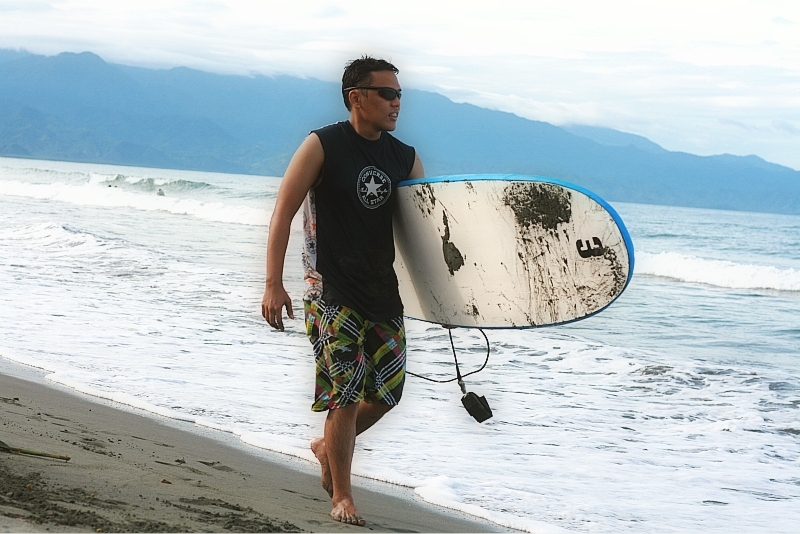 !’ arnel thought me a couple of tricks from walking/balancing on top of the board, to how to u-turn when waves are coming and paddling among others. 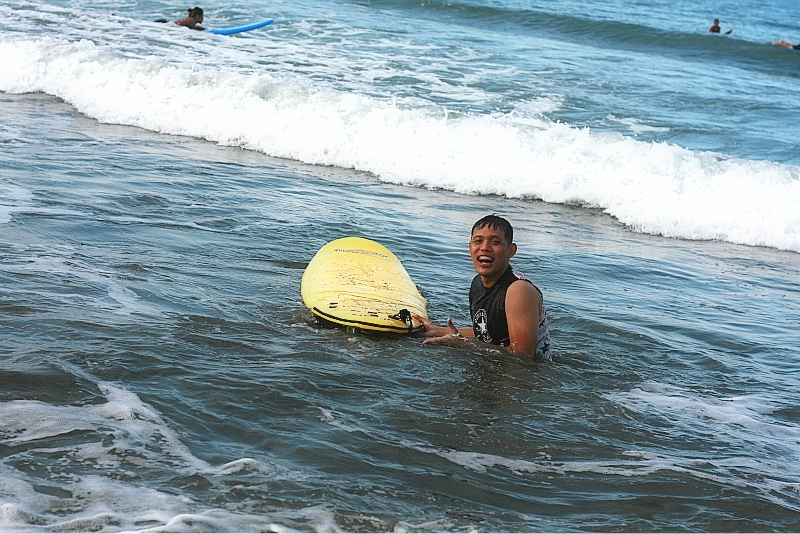 but he told me that the most important thing in surfing is you must get to know the waves. 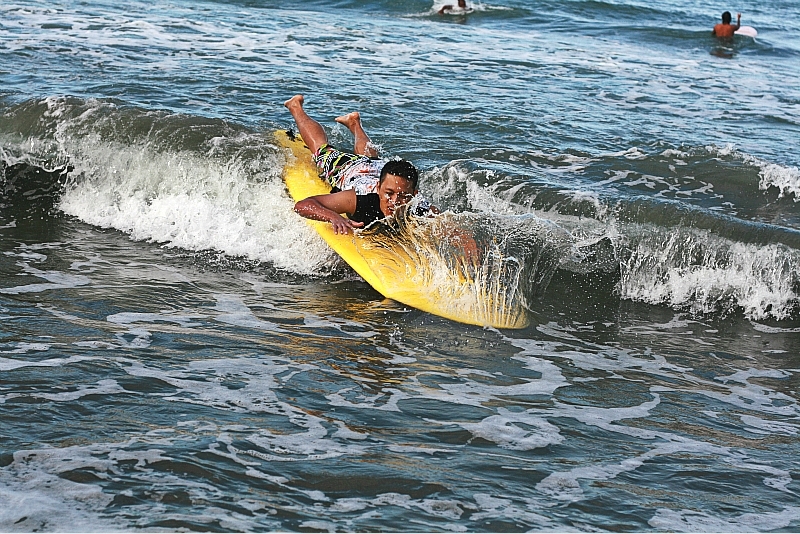 as a surfer, one must know how to make ‘kilatis’ the waves. unfortunately though this was the hardest part and we werent able to perfect the skill. he said it will take me about at least a day more of intense training to finally get the hang out of it. 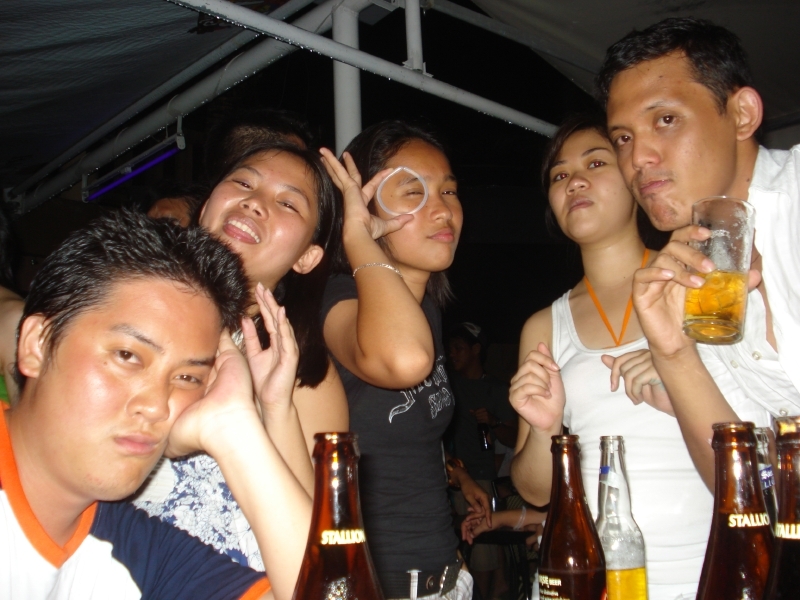 see the nag mama-angas photos below….lufet! 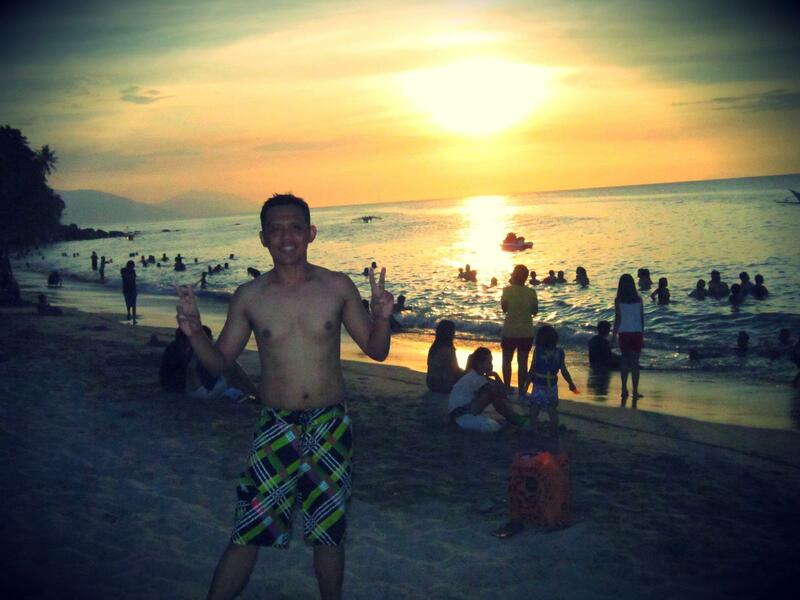 it was already around 6pm when we got out of the water to watch the famous Baler sunset. much to our dismay, this place is also a ‘stop over’ of heavy clouds and thunderstorms that we again failed to see the sun bid farewell for the day. 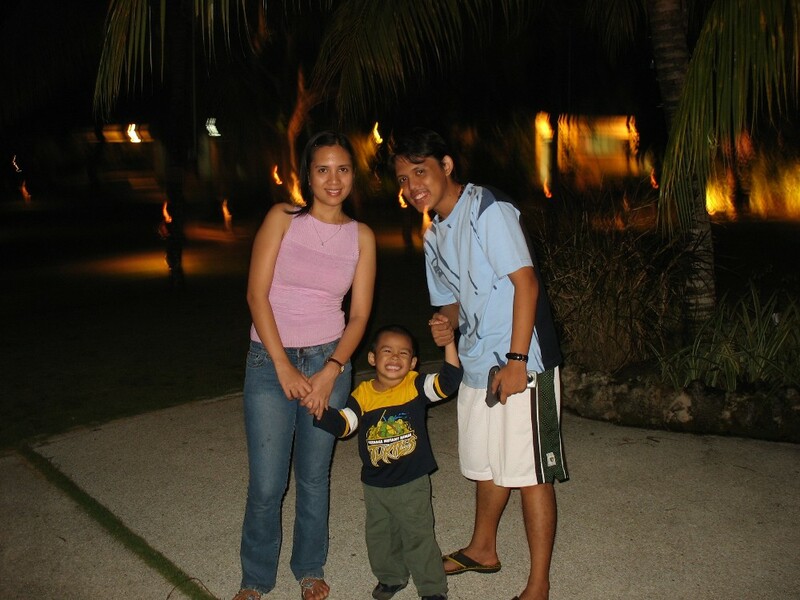 we ended up sitting on the beach front, with a bottle of RH and in silence trying to absorb what just happened earlier…or maybe we were starting to feel the body pains already that moving in and around (and even talking) was already a struggle. i got injured in my left ankle by the way…but still…it was one heck of ‘MALUFET’!!!! 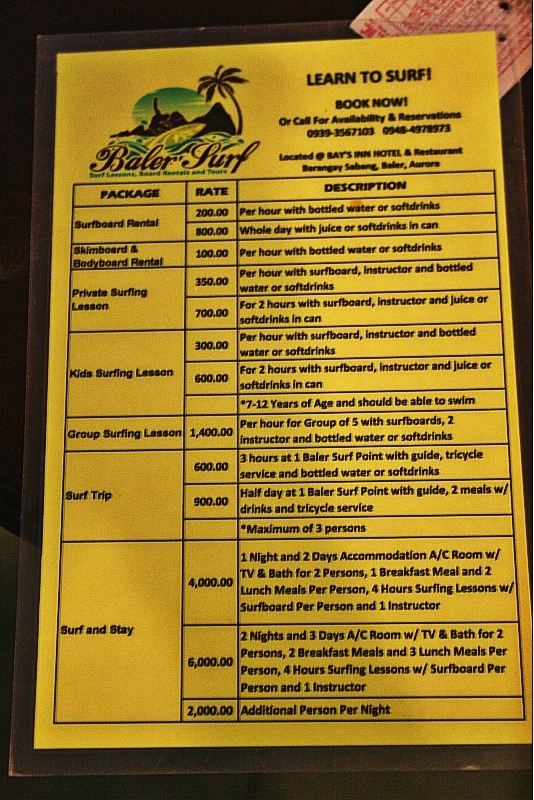 surfing lessons come w/ a FREE bottle of water or softdrinks. surfing trainors are really a kind bunch, if only i have the extra bucks i would have invited them over a drinking spree after lol. 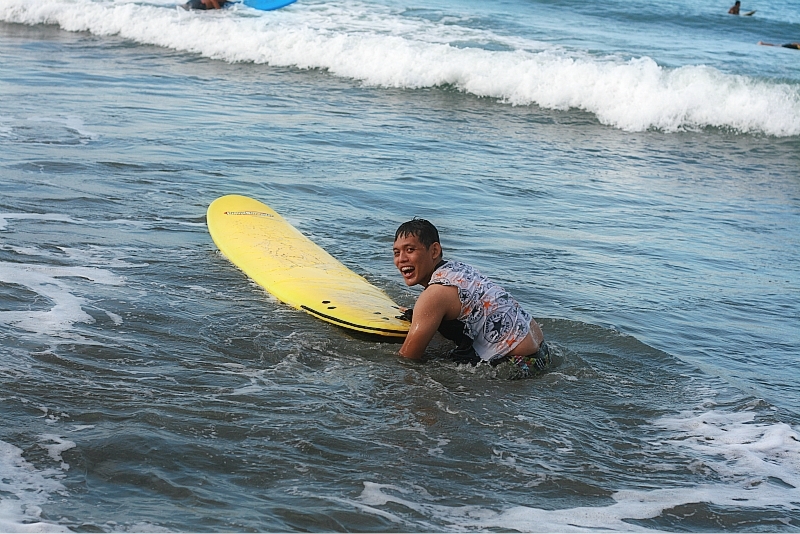 surfing doesnt necessarily need any requirements, for beginners even if non-swimmers pwede. 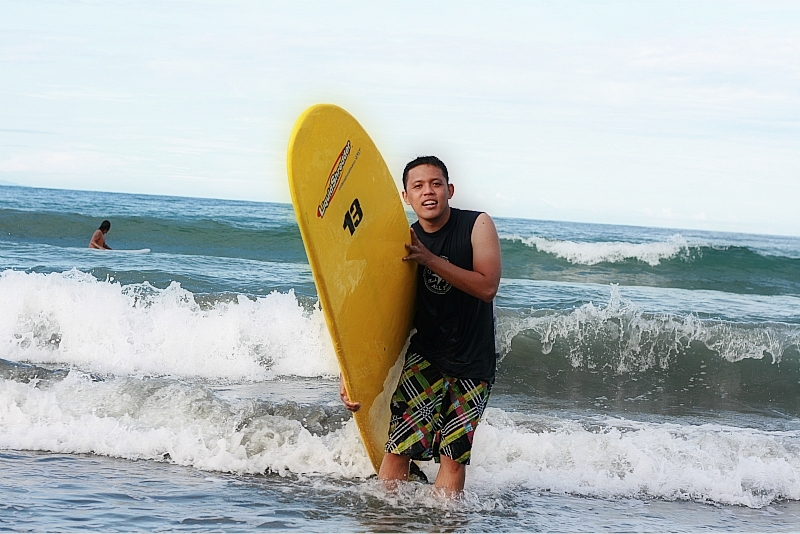 the best time to go to Baler for surfing is of course summertime to make the most out of the summer heat (thus the absence of ocassional rainshowers and thunderstorms w/c i dont like when travelling on a beach destination). BUT the waves are still the same even on none-peak seasons such as August. 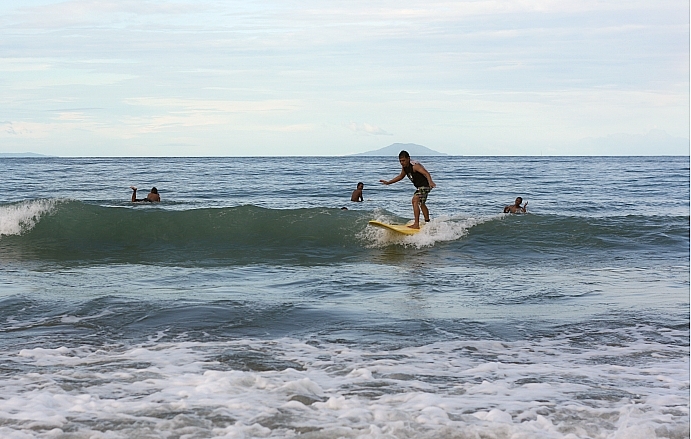 you can learn basic surfing in half a day, but if you really wanna LEARN it, save 2 days. 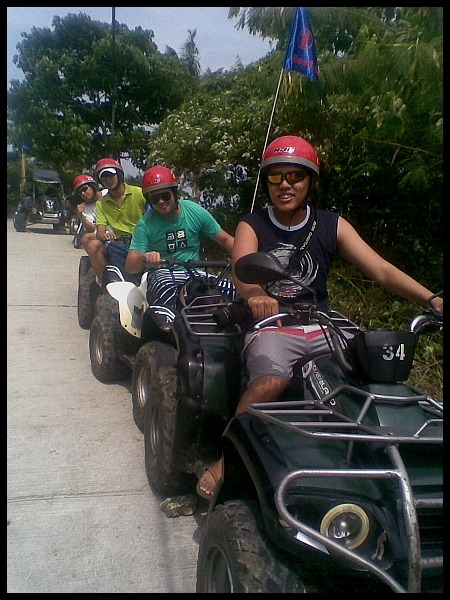 more details of the Baler trip on the second part..coming up next! Kiltepan and its Sunrise : fly high! 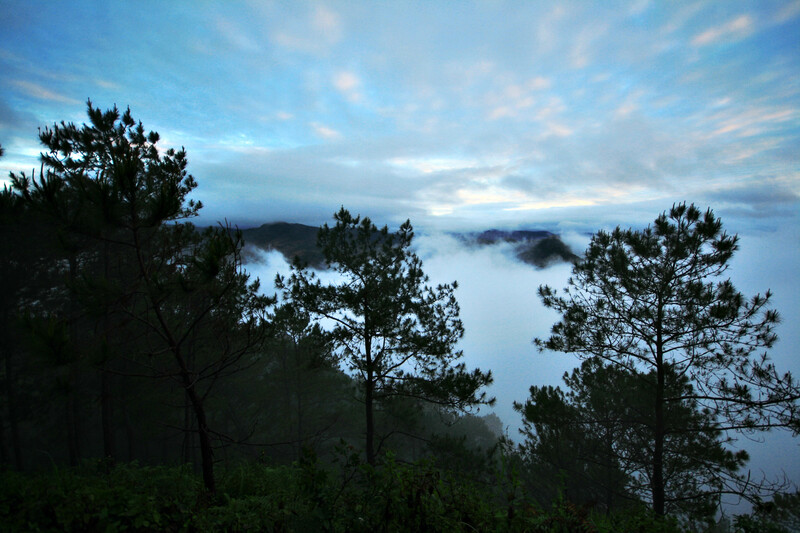 Our third day in Sagada started off way too early at 4 o clock in the morning to catch up on yet again one of Sagada’s most sought after natural scenery : the Sunrise view at Kiltepan peak. Coming from the other day’s exhausting but really fun adventure, it was all but a challenge for me to wake up that early. the cold weather coupled with the familiar (and provincial) sound of dawn that i always long to hear plus the king size bed and the comforter all to myself made getting out of my bed such a struggle. Good thing Doi was already up on her feet and was all made up when i woke up so it was really ‘jahe’ for my part not to move and prepare for the early morning itinerary. roughly at around 430am our tour guide arrived. we wasted no time and drove ourselves all the way up to Kiltepan peak. 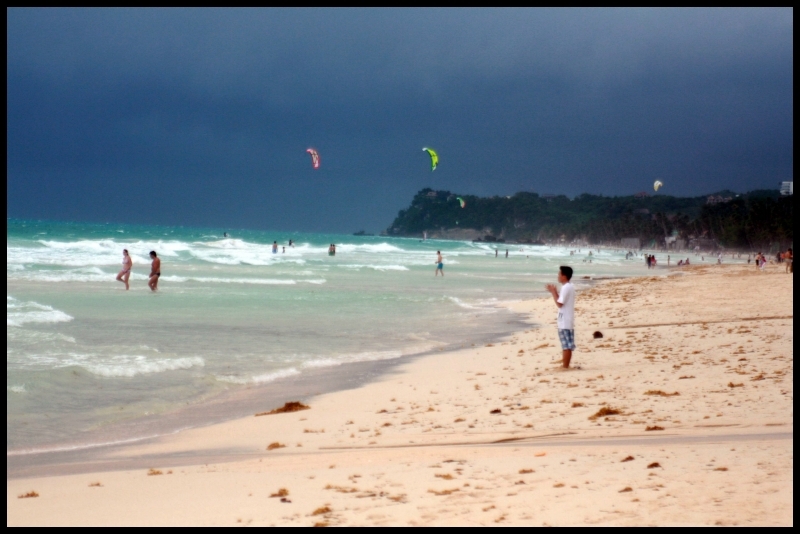 we were a bit worried though because of the unfavorable weather in the area. 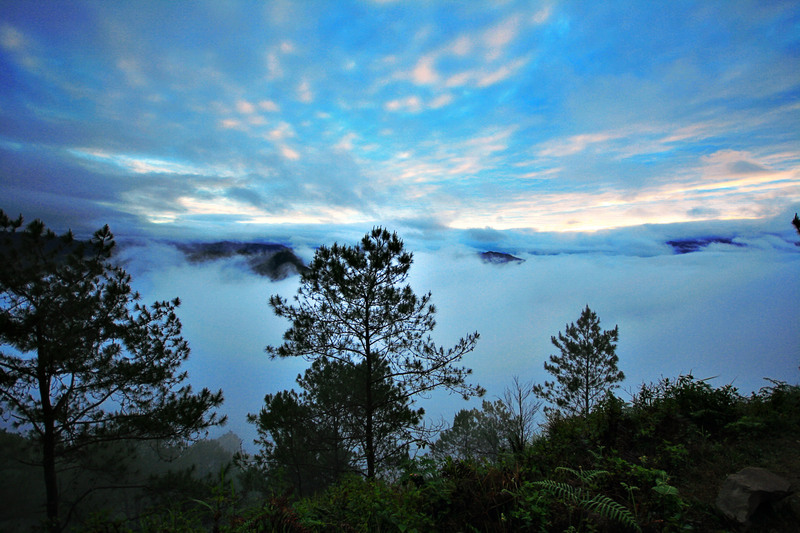 we were thinking we might not be able to witness the sunrise since clouds and thick fog might cover the view. 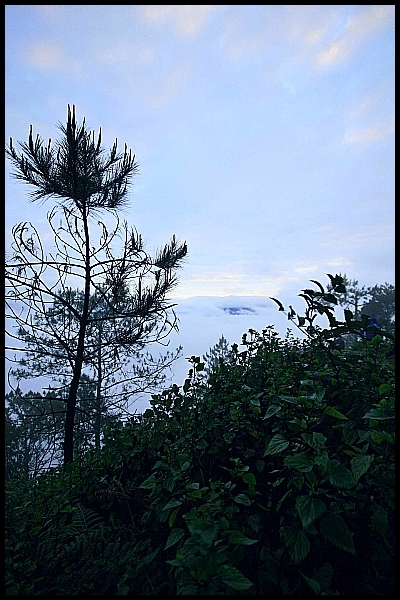 30 minutes after and a vehicle break down, we were already at Kiltepan peak view point…and yes we were right. 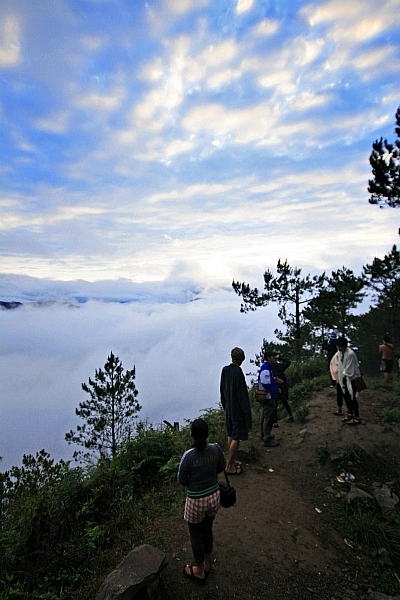 the view was covered with THICK clouds and fog. 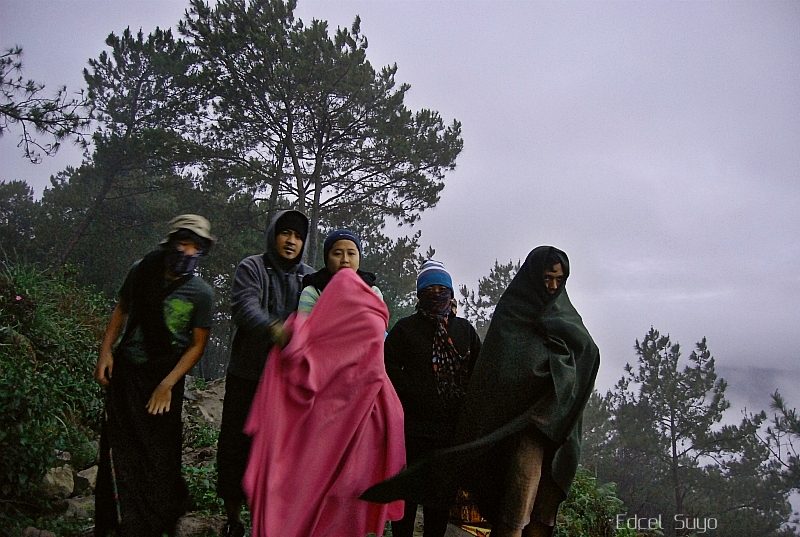 and the temperature was very cold and the wind blew on us quite strongly. it was not a mistake that me and Carla brought with us our extra blankets. 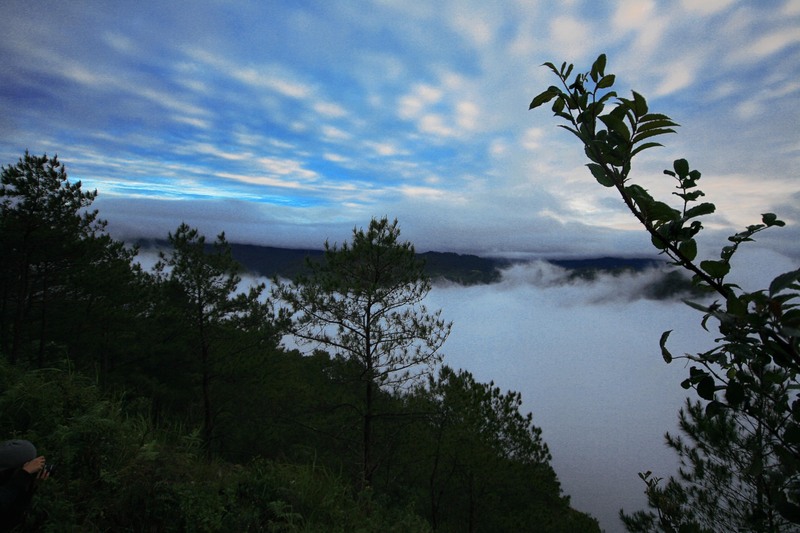 while awaiting for the fog and the clouds to settle, Tita Myrna started to sing songs of Praise and other Christian songs. it made the whole scanarios of us waiting in silence and in awe more melodramatic. 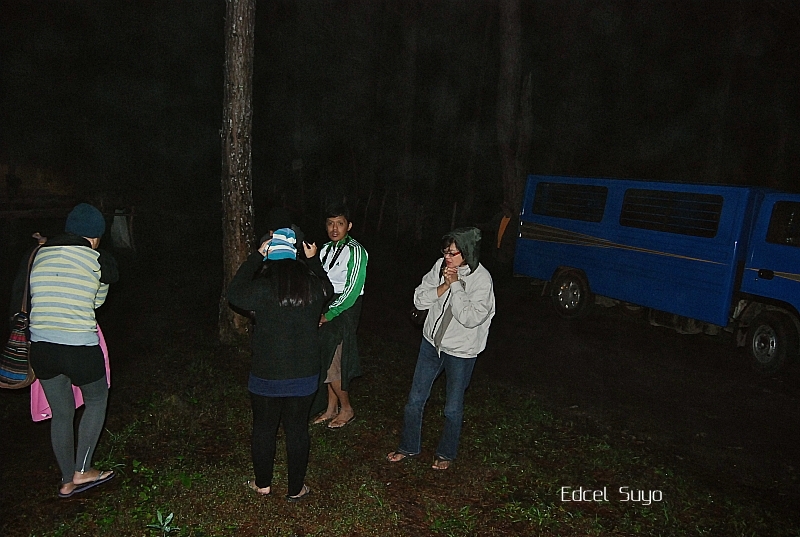 it felt like we were in this some indie film or a docu film about the ifugaos hehe. finally after a few minutes of waiting the sun finally rose, giving us a perfect view of what was really in front of us. unfortunately though, he did not show his beauty to us. he hid himself behind the clouds, there were a few times that we almost got a glimpse of him but sadly, the clouds only came too quickly to cover him again. Just like what any other tourist would do, we wasted no time and took pictures of the still magnificent view and ourselves. 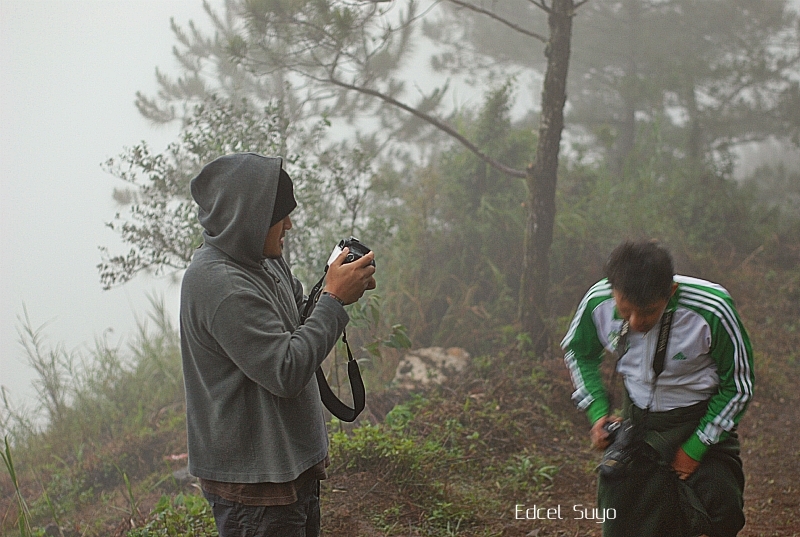 Edcel actually did a crazy thing in Kiltepan – he removed his shirt and posed for photos half naked for about an hour! lol! 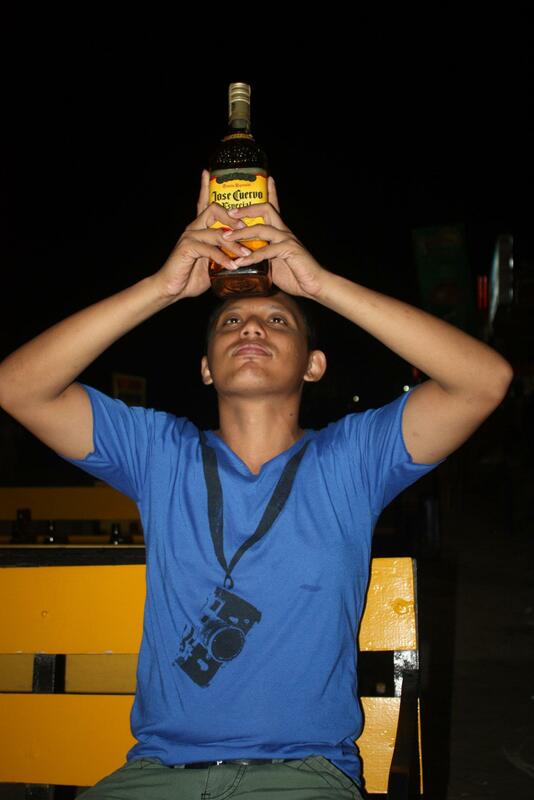 i will leave the whole ‘kwento’ to him on his blog.